Copyright: Mary Ann Matulis, 2012.
words: Story submission in the subject heading of the email. Heaven book feedback, in the subject heading of the email. People who pray and call to Heaven for help can and do change the world, by the magnificent grace of God at work in all our lives. The accounts below, a collection of such workings of grace and help from above to us incredibly needy humans here below, call forth a conviction of faith and a real growth in hope. Our God is alive and active in so many ways and it is always exciting to read about it. I would not be writing this here in Sydney, Australia, had not my mother (Maria in "A Miraculous Escape") had Our Lady's mantle put over her shoulders so many years ago and speedily whizzed up a hill to the last train to leave Hungary to the West before the country-wide Communist crackdown. No wonder she had huge faith in her heavenly mother after that, and she never saw her earthly mother or brothers again. May you be blessed with a deeper faith and greater hope and joy by reading these stirring and wonderful accounts of God coming mercifully to our aid, so often through the prayers of the Saints who love us and time-polished devotions to so many in the Court of Heaven. Esther Szabo Nott, BA Dip Ed. October, 2009. The names used in this book are not the real names of the people mentioned in the stories, except in the stories where the person or people have specifically requested this. A note about the use of the words “miracle” and “miraculous”, when ever these words are used in a story, they are not being used in the sense that the Church uses them, that is in a theological sense, but only in the everyday sense that people use these words, when expressing amazement or astonishment after receiving a favourable answer to their prayer. This book contains a collection of inspirational stories of answers to prayer that come from my own experiences and from those of family, friends, relatives and acquaintances. A varied range of life’s circumstances are covered in these stories. The intercession of several saints and devotions are involved. The stories detailed in this book took place in Australia, Croatia, Belgium, Canada, Hungary, U.K. (Scotland, Northern Ireland, England), Norway, Lebanon, Ghana, New Zealand, Philippines, USA, France, China, Italy, Malaysia, Germany, Namibia, Ireland, Uganda, Brazil, South Africa, India and Malta. I thank everyone who shared their stories with me, and I and hope that these stories will help you to grow in your Catholic faith. This book came about because a priest who is a friend of our family, repeatedly asked me to “write a book.” At first I was reluctant to do this, but eventually started to think about it and wondered what on earth I would write a book about. The thought then came to me that there are many wonderful stories to tell about how God helps people in their everyday struggles and needs, so I got to work and the book: Help from Heaven (Answers to Prayer) is the result. This book had its basis in my childhood, as I watched my mother pray to the Holy Infant Jesus of Prague, and saw the speedy answers to prayer that she received, especially in financial difficulties. My mother also told us about answers to prayer that had happened in her family, and also some other testimonies that she had heard about. In addition, my parents subscribed to a Catholic magazine which is published here in Australia, which regularly published testimonies of answers to prayer, from women who had prayed to Saint Gerard Majella, (the mother’s saint). Many of these were to do with cases of infertility. The testimonies in this book would not pass muster in the watertight atmosphere of the Vatican, and the Lourdes Medical Bureau as miracles, but they certainly show prayers that have been answered. After all, most of us are happy to have a healing of our sickness, e.g. back pain, or to get a job in a tough economic climate, when jobs are few. We are not out to get a miracle, only to get our prayers answered. However if that takes a miracle, that is fine with us! Despite the great importance of the Rosary, many Catholics, even those who are practicing, do not have an adequate knowledge of the way that is should be said. They are aware that certain prayers are said, but do not always realise that meditation on the mysteries is also required, other people would like to start saying the Rosary but need guidance in this area. The book addresses these needs and also examines some issues regarding miracles. The following story was told by the late Father Aedan McGrath an Irish missionary priest, at a talk which he gave when visiting Sydney, Australia. Father McGrath was in China during WWII when the Japanese army invaded the country. The Japanese were advancing towards the area where his parish was located. The local women were terrified of what might happen when they got there. The women begged Father McGrath (who was a very small man) to protect them. There was very little that he could do. He prayed to Our Lady for help. When the Japanese soldiers arrived in the area, the soldier in charge of the unit, came to talk to Father McGrath. It seems that this soldier had a big crush on the Hollywood actress Loretta Young, who he had seen in movies. He wanted to know if Father McGrath had ever met her. As it turned out, Father McGrath had actually met her, probably through an association with another Irish priest Father Patrick Peyton, the founder of the Family Rosary Crusade. (Father Peyton knew many Hollywood stars and was able to persuade them to be on his radio programs about the Rosary.) The officer ordered his soldiers to leave this village in peace, just because Father McGrath knew Loretta Young! The following story comes from the U.S.A. The greatest miracle that I have ever received is becoming a Catholic. It was the furthest thing from my mind. I was going to the Assembly of God Church and had been doing so for years. As I was driving in my car coming home from Church, I looked up and said, “Lord I am missing something, what is it?” I never truly thought that I was going to get an answer. It was just a passing thought for me. As I began my week someone spoke to me saying, “Go to my Son. He lives in the tabernacle of the Church.” Even though I say someone, there was no mistaking who it was, Mary! What did I know about Mary, other than she was the Mother of Jesus? I had never heard of a tabernacle being anywhere on this earth anymore and did not know where it was, but I did know one thing, and that was that I did not know Mary. I did not want to know Mary, and I told her so, many times. This began a battle of wills for over a year. I looked up and repeated many times, “Surely not Lord? Surely you do not want me to become a pagan?” “They worship and bow down to statues!” It would go from there to, “Mary get away from me. I do not know you, nor do I want to.” Then to, “Go to my Son. He lives in the tabernacle of the Church.” I truly thought that I was going to lose my mind. Because of my religious background, I had always connected Mary to the Catholic Church. I have a neighbor who is a Catholic, so I went and asked her, “Do you have a tabernacle in the Church?” You can only feel my astonishment when she said, “YES!” Then she explained to me all the beliefs of the Eucharist and it was Jesus in His totality. The battle between my will and God’s Will started up again. “No God, this cannot be. Please God do not make me do this. They are pagans God, and worship this woman who will not leave me alone!” Finally after over a year of this, I was coming down my hall way and said, “Okay God, if you want me to be a pagan you can have it, but please get this woman off of my back!” What made me say this? Mary completely wore me out. She never stopped. I never saw her, but I heard her continuously day after day. I called the Church and was put in touch with my RCIA teacher, and the rest is history. Now I call it, “One of the greatest blessings of my life.” God sent Mary to call me to the Church. I realize now, she called me to her Son, as that is what she does. Mary stayed with me for over 365 days. I was not nice to her at all, nor did I want to be, but she never gave up on me. I remember now that when our mothers wanted us to do something and we did not do it, how they would “nag” at us. It was the sweetest nag that I have ever heard or ever will hear. I owe my spiritual life, to God sending our Blessed Mother to call me to her Son. There was also someone praying for my conversion. I have never regretted becoming a Catholic and the most wonderful thing in the world to me is living as one. The next most wonderful thing is going to be to die as one. Never under estimate Our Lady. She is loving, kind, persistent, and only wants and prays for what is best for us. We can never go wrong praying the Rosary and asking her to pray for us. Trust me it is truly a miracle that I am a Catholic today. Each month I used to meet with a friend. We attended Mass at the cathedral and then had lunch at the shopping centre afterwards. On one of these occasions my friend showed up with a very severe case of laryngitis. She told me that she had been in this state for a few weeks. I introduced her to the priest and he gave her a blessing in honour of Saint Blaise, (the saint who is invoked for protection against throat problems.) I jokingly remarked to her, “You should be all fixed up now because Father has blessed you." We went into the church. A few minutes later the Mass began and I was amazed to hear my friend singing the hymn in her full strength soprano voice. On Saint Blaise’s feast day (February 3), there is a special blessing. The priest takes two candles which are held in a crossed position and places them upon the throat of the person to be blessed and invokes Saint Blaise to protect the person from throat troubles. A mother from Brazil took her dying daughter on a trip to Paris, to visit the chapel where the apparitions of the Miraculous Medal occurred in 1830. When they arrived at the chapel, they saw a nun who was arranging flowers on the sanctuary. The mother asked her if it would be possible for her daughter to touch the chair, that our Lady had sat on while talking to Saint Catherine Labouré during one of the visions. The nun said that it was not allowed. She then went into the back room to get some more flowers. The area where the chair was, had been roped off. The mother thought to herself, “I did not come all this way, just to look at the chair.” She told her daughter to get down on the floor, work her way on her stomach under the rope, move up and quickly touch the chair and then come back. To the mother’s distress the little girl went up to the chair, and placed her head upon it, and would not come back for quite a while despite her mother’s pleading. The mother was worried that the nun would come back and that they would get into trouble. Eventually the little girl came back, and the mother asked her why she had done this. Her reply was “I am sorry mummy, but the lady told me to rest my head on her lap”. After this they returned to Brazil on the plane. Soon after their return to Brazil doctors found that the child was fully healed. The prayer on the Miraculous Medal prayer is: “O Mary conceived without sin pray for us, who have recourse to thee”. Many favours are granted to those who wear the Miraculous Medal and who pray to Our Lady confidently trusting in her intercession. These favours include healings, protection in danger, conversions, help to fight temptations and many other needs such as employment. The feast day of the Miraculous Medal is celebrated on November 27. For many months I had been suffering from a painful heel spur. I carried out the therapy which my doctor prescribed for this condition. Despite the therapy, things were not going well. The International Pilgrim Virgin Statue of Our Lady of Fatima was bought to Saint Mary's Cathedral in Sydney, so not wanting to miss this opportunity, I traveled for an hour on the train to the city from my home in the suburbs. After getting off the train I started to walk to Saint Mary's Cathedral. As I walked, the pain in my foot started escalating; however it was still bearable so I struggled on and attended the morning devotions and talks about Our Lady of Fatima, and the exhibition of the International Pilgrim Virgin Statue of Our Lady of Fatima. At lunchtime I left the cathedral in order to go and buy some lunch, and had to walk through Hyde Park. The pain in my foot reached an unbearable level. I was reduced to almost a cripple and was alarmed to be alone unassisted at such a critical time. It felt as though a sharp knife was going right through my foot. It was probably the very worst day that I had experienced with pain in this foot. After lunch I hobbled back to the cathedral for the afternoon devotions. Before leaving the cathedral I prayed in front of the International Pilgrim Virgin Statue of Our Lady of Fatima for some special intentions, including the healing of the pain in my foot. After the afternoon session I managed to walk back to the train and returned home. From that day onward the pain in my foot started decreasing and it was soon gone. Several other petitions which I prayed for in front of the Fatima statue were also granted rapidly. One of these favours was actually granted while I was still on the train traveling to Sydney with the typed up prayer petition list in my handbag, although I did not know this at the time. The next morning I received an email regarding this important matter, which gave me the time of the event which I had prayed about. To my amazement many of the other petitions were granted promptly within a couple of days of praying in front of the Fatima statue. The International Pilgrim Virgin Statue of Our Lady of Fatima of Fatima has been traveling the world since 1947. It is always associated with signs, miracles and wonders. One morning I was unable to open my home office door from the adjoining room using the key, so I went to the outside of my house and tried to open the front door leading to it.This also failed. I said a few prayers for the Holy Souls in Purgatory and asked them to help me to get into my home office. I promised them that if they helped me immediately, that I would publish the favour. I informed my husband of the problem. He asked me for the keys and went to open the office door (from the adjoining room.) It still would not open. There was obviously a fault in the lock. My husband then pulled the door handle towards himself while he turned the key in the lock and the door swung open. I used his technique until the door lock was repaired. (The publication of favours granted by the Holy Souls in Purgatory encourages other people to pray for them and to ask for their help.) All Souls Day is commemorated on November 2. When my daughter was about three years old she was displaying severe autistic behaviour. We first tried to send her to the local preschool. She was totally unable to cope and cried a great deal and would sometimes vomit because of the stress. The pre-schooling for her was totally unworkable. (She was unable to communicate at this stage of her life, but has since told me that she was afraid that I would never come back to pick her up from the preschool.) The Autistic Association came up with the idea of sending her to one of their schools which was many miles away. I was amazed that this was suggested in view of the fact that my daughter could not even cope with one hour at preschool, so I turned to Saint Joseph for his help and for seven Sundays in a row I prayed fourteen Glorias, in honour of the Seven Sorrows and the Seven Joys of Saint Joseph. On the first day that she had to travel to the special school in the school taxi, she acted completely uncharacteristically. My daughter was calm and relaxed. She hopped out of the car on arrival at the school and waved goodbye to the lady from the Autistic Association who was helping out. From then on my daughter had no more difficulties separating from me or the carer in order to go to school.The feast day of Saint Joseph is celebrated on March 19. When Father Joe was on a visit to England, he urgently needed to find accommodation. Father Joe had not yet booked a hotel to stay at. He was trying to figure out which saint was the patron saint of accommodation. Since he did not know that, he decided to pray to Saint George because he knew that he was the patron saint of England. Father Joe soon found a room to rent and then to his surprise he discovered that it was located in Saint George's Square next to Saint George's Anglican Church. Whenever he invokes Saint George similar signs are given to him. The feast day of Saint George is celebrated on April 23. A friend telephoned me with an urgent request. She told me about an abortion that was scheduled for the very next morning and asked me to pray that it would be stopped. She also telephoned other people to ask for prayers. It was short notice for such an important petition and I wished that I had been told about the planned abortion much sooner, but I prayed as requested. To my great joy, the man and his girl friend decided to keep the baby. My daughter married and she and her husband had a nice home, travel, good jobs and they were just made for one another, but when they tried to start a family everything went wrong. She kept getting pregnant, seven times in fact and kept losing the babies. Her body does not make progesterone and that is what the babies need to live on, especially during their first three months in the womb, and she lost her babies in this time frame. With each miscarriage came depression and she wanted a baby so badly that I think that she would have stolen one out of a baby carriage if she could have. I tried to support her to the best of my mothering capabilities, but I could not relate because I had children. I did not even profess to know how she felt, but I began to understand one thing. It must truly be an awful feeling and nothing that I said really made any difference, she just sunk deeper and deeper. I did not even relate to this daughter who used to have so much life in her. The life went out of her. Then one day I got a call, “Mom I am pregnant with twins.” Well my heart sunk, not for the pregnancy, but all I could think of was, “God if she loses two babies she will die inside.” I truly did not see anyway out of this for her, so I begin to pray the Rosary daily and to Saint Gerard Majella, (the prayer for expectant mothers.) I did this everyday for almost nine months as they were born a little earlier than full term. She was on bed rest for most of the pregnancy, so she had to quit her job. Anyhow around eight months later came a little boy and a little girl. That is right, one of each. She is now a very busy and sometimes anxious mother. Every time I look at those babies, all I see are two miracles from God. I thank Him for hearing the prayers of our Blessed Mother and Saint Gerard, and for answering those prayers from all of us. I cannot tell you how sweet and precious those babies are. They will be two years of age this October. The following two favours took place in Norway. A twenty-one year old girl developed an obsession which caused her to become very fearful. A friend told her to say the Saint Gertrude prayer for the Holy Souls in Purgatory many times a day and to ask for their intercession in the matter. At first the girl did not want to say this prayer because she was a Protestant, but then she gave in and said the prayer and was freed of the fear and obsession. This convinced her of the powerful intercession of The Holy Souls in Purgatory for their benefactors. She gave the Saint Gertrude prayer to a girl who was suffering from a very bad dose of the flu complete with a high fever. The sick girl had been planning to go on a trip with some friends but that seemed to be out of the question. She too decided to say the prayer and by the next morning felt really well. She was completely free of the flu and was able to go on the trip. Maria fled her home in southern Hungary because of the impending communist invasion. She left her mother and two brothers behind and never saw them again. She cried and prayed as she struggled to get to the railway station in the far north west of Hungary, near the Austrian border. Maria was very afraid, as she struggled uphill with a heavy coat on one arm and a suitcase on the other, because she knew that this was the last train that she would be able to catch before the border would be closed. As Maria was having trouble walking up the hill, a beautiful lady appeared and wrapped her in a blue cloak and in no time at all she was on the train. Was the lady who appeared, Mary the Mother of God? We do not know, however that would be a reasonable assumption, because Our Lady is Maria's patron saint. When we lived at Westmead, my youngest child Anne, (who suffers from autism) refused to give up the stroller. She was always refusing to walk, and she used to throw herself on the ground, often screaming her head off. I could not do any shopping with her unless she was in a stroller. Finally the stroller broke because of her increasing size and weight. She really was well over the age for strollers. I telephoned my husband at his work place, and asked him to buy me a stroller in Parramatta on the way home. He could not see the point in this, and I got very upset and started to cry. I told him that I would be stuck in the house with Anne if he did not buy the stroller and that I would not be able to go anywhere or do any shopping. He thought that Anne would probably stop using a stroller within a few weeks, and that a new stroller would be a waste of money. After my husband's refusal, I got out a statue of St. Philomena and lit an oil lamp before it, and I sent up many prayers to her. At about 3 pm I received a sign from St. Philomena then the doorbell rang. I opened the door and a married couple were there, and they presented me with a good stroller saying "This is for your little girl." I was so stunned that I forgot to thank them. "How did you know that I needed this?" I asked. You were in our (plant) nursery a few days ago, and we thought that the stroller that you had was not in good condition and that you needed a better one. We left our nursery at lunch time, drove home and got the stroller for you". I did not even know these people. The second stroller story is a bit different to the one above but Anne’s autism, behaviour, size and weight have a part in it. We did not bring a stroller from Westmead to Doonside when we moved, so this is the next part of St. Philomena's intercession in relation to strollers for Anne. When I first moved into my current home, I was given a stroller which I used for transporting my daughter Anne. Although Anne was actually by then about four years of age, unfortunately a stroller was an absolute necessity if I was to get any shopping done, because when I took her to the shops down the street, she threw tantrums on the footpath due to her autism. Two weeks after we moved in, the lady who sold me the house came to our home with a very good stroller which her daughter no longer had a need for. There was something tied to the handle-bar which resembled a Saint Philomena Cord. I showed it to my family and they all thought that it was a Saint Philomena Cord. None of my family guessed otherwise. When I asked the lady what the cord tied to the handle bar was there for, she looked puzzled and she clearly did not know what it was or how it had got there. It seems that it had not been tied to the handlebar when she got it from her daughter's house. The lady did not have knowledge of Saint Philomena devotions such as the Saint Philomena Cord and she was far too serious a person to play games in order to try and deceive about a matter like this. I accepted the stroller with gratitude, but I was also surprised because the lady knew that I had already been given another stroller two weeks earlier by her husband. Because of the cord that was attached to the handle bar I understood that Saint Philomena had something to do with this gift. I wondered why Saint Philomena was giving me this stroller, in view of the fact that I already had one and did not appear to need it. About lunch time I took Anne to the shops in the old stroller and with her weight and the weight of the shopping, it broke just as we were arriving back home. I picked up the broken stroller, my daughter and the shopping and went into my house. Saint Philomena appears to have arranged a new stroller for me a few hours in advance, because she knew that the old stroller was ready to break. Because of this I was able to take the new stroller with Anne to the school in the afternoon to pick up the other children. Without this stroller I would have had serious problems picking up the other children from school, because I could not leave Anne at home by herself, nor could I find anyone to look after her while I went there. Special note: A Saint Philomena Cord is the red and white cord which is blessed and worn around the waist under the clothing to honour Saint Philomena and to seek her protection and intercession. There is a special blessing formula for this cord. A bundle of clean clothing which had been brought in from the clothes-line was placed in the backroom. I walked into the dining room and as I did, I looked towards the backroom and saw a reflection of the various colours of the clothes. Their combined reflection in the window above them, created an image of Mother Teresa of Calcutta. (This was before her beatification.) Straight after I saw the reflected picture, I heard a loud explosion from the kitchen (the adjoining room.) Through the doorway, I saw large flashes of yellow light shooting across the kitchen. I knew that my husband was in there, but I could not see him from where I was standing. I was afraid that he had been injured and called out to him. My husband was unhurt. The electric kettle had exploded when he turned it on. I believe that Blessed Teresa of Calcutta protected him. The following story was told by a nun, who taught me at school. A mother of several children was expecting another baby. Her daughters made a novena for a baby girl. Her sons made a novena for a baby boy. Surely some of them were headed for disappointment. The outcome was that their mother gave birth to twins: a boy and a girl! Editor's comment: Although the lady was already carrying twins: a boy and a girl, before the children started their novenas, God who everything is present to, can take into account prayers which are said in the future. This was shown in the life of St. Pio of Pietelcina, in an incident where he explained to a friend, that he always prayed for the happy death of a relative who was long since deceased. I pray for the Holy Souls in Purgatory and also ask their intercession in all my needs. Since leaving school, I have progressed through various technologies, a manual typewriter, an electric typewriter, a Word Processor (a machine that looks and functions like an electronic typewriter, but is also able to store text data onto a floppy disk and print the data out), then I went onto computers, which our family has upgraded from time to time. The Word Processor was functional until a few years ago and then the disk drive stopped working, effectively reducing the machine to an electronic typewriter. I have a lot of files stored on floppy disks for the Word Processor, which I wanted to have a look at and make an assessment of. I prayed for a solution and a lady we know said that her husband had once repaired these machines for a living. He would have done that for us, but the replacement parts are simply not available and no one sells this equipment anymore. I was told by another mechanic, that even if the parts were available that it would be very costly to repair the Word Processor, (out of all portion to its worth.) In short the situation was hopeless. I put the broken Word Processor into the shed for storage, in case something could be done in the future and continued to pray. I prayed for the Holy Souls in Purgatory a few days ago and my brother telephoned me. He had just purchased a house for his family. The previous owners of the house left a few things in the shed that my brother and his family were allowed to have. My brother said that there was “an electric typewriter” in the shed and asked me if I wanted to have it. I started asking my brother questions about the typewriter. It turned out to be an upgraded model of my word processor. It is even the same brand. This is important because the floppy disks were formatted for this particular brand only and are incompatible with other brands of Word Processors. The Word Processor that my brother gave me, is in an excellent condition and can read the files on the floppy disks. It had one part missing (a plastic knob to turn the carriage), so I took that part from my own Word Processor and put it on the one that my brother gave me. The word processor prints well. Very few people would even require such a piece of equipment and they are almost impossible to obtain. My brother had no idea that I had been praying for exactly this. He showed it to his wife and asked her what he should do with this ‘typewriter.’ She advised him to throw it out! Then he thought of me and phoned. It is strange that he did this, because he is well aware of the technology that I have at my disposal, and that would have made anyone else think that I had absolutely no need for this piece of ancient equipment. My sister-in-law was astounded when I came to try the word processor out, with a box of disks to test the equipment. She had no idea that it was not just a typewriter. The intercession of the Holy Souls in Purgatory for their benefactors is amazing. The Holy Souls in Purgatory are not able to do anything for themselves or do anything at all to relieve their suffering: they rely on our prayers and efforts to help them. It is permissible to believe that they can pray for their benefactors.A lady I know was in a desperate situation where she faced possible bankruptcy. She did not have the money to pay the next month's mortgage so it was very important for her to sell the property almost immediately. The local council was determined to make her property a "heritage listed property" which means that she would not be able to make any changes to it without their permission, and that she would not be able to sell it either except under almost impossible conditions. This case had been dragging on at council meetings for a whole eighteen months. On the day of the final showdown council meeting, she was advised to offer her merits for the month for the relief of the Holy Souls in Purgatory and to ask their intercession in her property case with the council. At the meeting that night, one of the council members suddenly remembered a similar case where the council got their fingers burnt financially, when the owner of the property took the case to the Land and Environment Court and won the case. The council got "cold feet over the matter" and she won the case and was allowed to sell her property. Carol has been dealing with diabetes for a number of years, coupled with this is high blood pressure. Every time that she has a doctor’s appointment, Carol gets very nervous, when her blood pressure is taken, and that makes it go even higher. She came across a novena for the relief of the Holy Souls in Purgatory, and started the novena a week before her appointment. Carol went to the doctor’s appointment and her blood pressure was normal for the first time in a long time. While the nurse was taking her blood pressure, Carol was saying the Saint Gertrude Prayer (for the relief of The Holy Souls in Purgatory.) Carol will continue to pray for them by saying the novena, and will also have Masses said for their relief. The prayer entitled the Miraculous Responsory of Saint Anthony lists the following categories of miracles: raising people from the dead, freeing people from religious error, protection from all calamities, the cure of leprosy, the cure of all kinds of health problems, help in cases of demonic possession, calming the sea (to prevent ships from sinking and people from drowning), freeing prisoners from unlawful imprisonment, finding lost (or stolen) items, curing useless arms and legs (cripples), protection in all kinds of dangers, help in dire need (poverty etc.) and spiritual help. In the next section are some accounts of Saint Anthony’s help. Clare was suffering from an affliction which had been ongoing for several years. She had prayed often about this and then Clare prayed a novena to Saint Philomena on daily basis for more than six months, but she did not receive a healing. Later on she carried out a devotion which is known as the Nine Tuesdays in honour of Saint Anthony. This involves receiving Holy Communion for nine consecutive Tuesdays in honour of Saint Anthony. On the ninth Tuesday during the Mass (which was held in the evening), there was a huge thunderstorm and the electricity to the church was cut for a short while. The church was in darkness during this time, except for the lit candles, while this was happening Clare saw Saint Philomena. Because of this event, she knew that the healing would be granted. In due course Clare was healed of the affliction. (Saint Philomena, as well as Saint Anthony had interceded for the healing.) Special note: The devotion of the Nine Tuesdays in honour of Saint Anthony, was started by people to honour Saint Anthony, but when the practice fell into disuse it was revived by Saint Anthony himself, who recommended it in a vision to a lady of Bologna, Italy in 1616. It is a great way of winning Saint Anthony’s assistance. A man who lived in Australia, (where local telephone calls are inexpensive and not timed) had a free dial-up internet connection with an Australian provider. Later on he moved to Rome, and did not have access to a cheap internet connection. One of his friends in Australia prayed to Saint Anne for a solution. The man came up with a good idea. He dialled a phone call to Australia each night on his inexpensive international telephone card, and left the call open for the full duration of his free dial-up internet sessions. Some years ago I lost my watch. Late one night, a week later I finally prayed to Saint Anthony for help to find it. The next morning we drove to the parish of Saint Anthony of Padua, which was some miles from our home and attended Mass there. After Mass I stayed behind a little and my husband went back to the car park to wait for me. It has been raining for a week and the grass was long, wet and muddy. My husband saw something shining in the grass and out of curiosity he bent down and scooped up a handful of mud, and to his astonishment my watch was there in the handful of mud. What was the explanation for this? We had attended a Mass at that church the previous week. John was thirty-eight years old and still a bachelor despite his best efforts to socialise and to find a wife. He made a pilgrimage to Italy and France and prayed at the Sanctuary of Our Lady of Lourdes and also at the tomb of Saint Anthony in Padua for this intention. When John returned home there was a letter for him from a lady who suggested that he correspond with her goddaughter, who lived in another country. John followed this up. He realized that this was the answer to his prayers. They have since married and are the proud parents of three daughters. 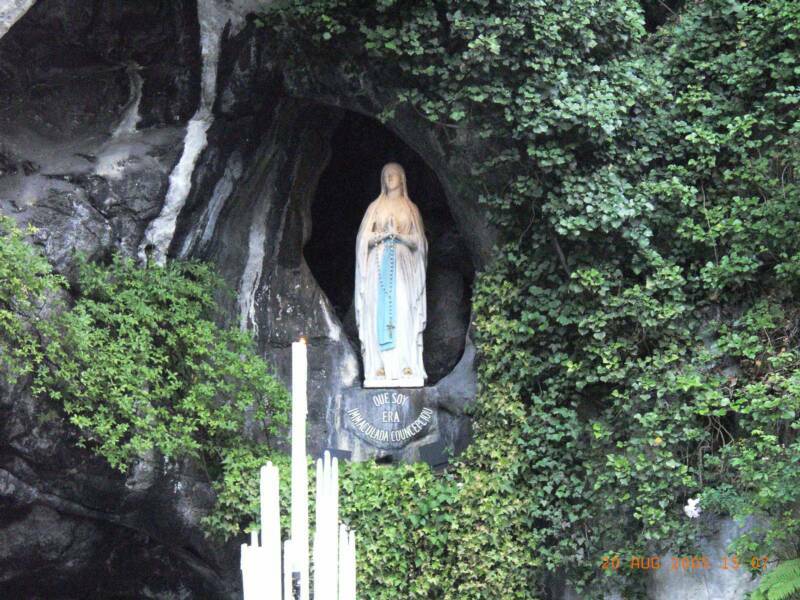 The feast day of Our Lady of Lourdes is celebrated on February 11. On a very hot day of about 100 degrees Fahrenheit, I was in my daughter's bedroom when the bedroom door jammed shut. Nothing that I could do would open it. I was trapped and in a panic. My throat began to dry out and there was no water to drink. It was only about ten o’clock in the morning. My three year old autistic daughter was on the other side of the door without supervision. We lived on the main road. There was just too much traffic and noise for anyone to hear me. My husband would not be home for many hours to 'rescue' me. In fact he was going to work back until 10 p.m., also there would be no one to let my other children in from school when they came home. The air conditioner in the bedroom was not working properly so I soon became stressed in the heat. The air conditioner was actually positioned in the window, so I could not open it for fresh air nor to climb out of the room. I had a few statues of saints in the room and an oil lamp lit in front of some of them, including Saint Anthony. I tried a few prayers, but could not even say one Hail Mary in my total panic. Finally I said the shortest of all prayers in a very loud voice. "SAINT ANTHONY HELP!" I tried the door once more with as much force as I could manage and it sprung open much to my great relief. My brother-in-law was decorating a very tall Christmas tree which was covered all over with decorations. As he was putting up electric coloured light globes, one of them slipped from his hand. It was only a very small globe. He spent ages searching for it without success. He complained to my sister that the other lights would not work because the missing globe was essential to the whole scheme of things. She told him to “wait just a minute” while she prayed to Saint Anthony. My brother-in-law then retorted “Don’t you think that Saint Anthony has much better things to do than to worry about the light globe?” My sister then said the following prayer: “Saint Anthony, please show him where it is.” Immediately my brother-in-law called out “Hey, what do you know, here it is, in the middle of the Christmas tree.” No petition is too great or too trivial to ask Saint Anthony for. My husband and I stopped at a shopping centre for about five minutes and then returned to the car park to go home. There was an unpleasant surprise for us, the car had been stolen! My husband said that we should go back into the shopping centre and report the matter to the shop security guard and the police. I then prayed the Miraculous Responsory of Saint Anthony for the return of the car, and also asked Saint Anthony to ensure that no damage would be done to the car and that the groceries in the car would be left there. The car was stolen at 1 p.m. on a Wednesday and three days later on Sunday morning at 3 a.m. the police phoned to say that the car had been found, in good condition. It had been driven many miles across the Sydney suburbs. None of the goods in the car were missing or damaged, just as I had requested from Saint Anthony. Some years ago a big bike ride was organized by the road and traffic authority (RTA) which involved over two thousand participants. The ride was from North Sydney to Parramatta, a distance of 50 km. My husband and my daughter were among the participants. I caught the train to Parramatta with my youngest daughter in order to meet up with them at the end of the bike ride. It was a very hot day. Streams of bike riders entered the huge park at the end of the ride. My little daughter became anxious because of the long wait. It was taking a long time for all of the bike riders to arrive and still there was no sign of my husband and daughter. We persisted despite our growing anxiety, to wait even longer. Finally I decided to say the Miraculous Responsory prayer of Saint Anthony. As we walked down the hill to the bottom of the park, I could see an endless stream of bike riders still entering the park. However I still could not see my husband and daughter. I decided to ask one of the bike riders if there were still more bike riders to come. He addressed me by my Christian name and told me that there was nothing to worry about, because he had seen my husband and daughter, enter the park a short while ago. He said that they were now at the other end of the park. I was astounded and wondered how this man knew who I was, since he was not recognizable to me, because of his helmet and beard. It turned out that he was my cousin, who I had not seen for about ten years. After Joe and Carol spent some time near the lake, they continued on their drive.They had driven about ten kilometers when Carol discovered that her sunglasses were missing. They prayed to Saint Anthony and then drove back to the lake in the hope of finding them there. One more prayer was offered to Saint Anthony. Straight after they returned to the spot, Joe looked down the bank, and in the distance he could see something shining, because he did not recognise what it was, Joe headed down to investigate. It turned out to be Carol’s sunglasses. Patrick drove to the airport to pick up his fiancée Anna. Because it was her first day in the country he took her on a little tour before continuing to drive her to his mother's house. Patrick stopped the car at a local scenic spot and they got out of the car and went down to look at the river. Unfortunately she had left her handbag in the car and the window was open. When they returned to the car, her handbag was missing. There were a couple of people nearby. Patrick asked them if they had seen anyone near the car. They replied that they had not. Anna was very distraught because, among other things, her passport and other documents were in the handbag. Patrick then drove her to his mother's place. Anna was crying, because of the loss of the documents. In order to console her, Patrick’s mother said that she would telephone her daughter Leah and ask her to pray to Saint Anthony. Leah prayed the Miraculous Responsory of Saint Anthony and about twenty minutes later the police telephoned her mother, to say that the bag had been handed in. The police had found Patrick's mother’s phone number in Anna's handbag. All the documents, which were the only irreplaceable items in the handbag, were still there.The handbag was found many miles away from the place where it went missing. An office assistant named Catherine was sent to the bank each afternoon with the day's takings.This often amounted to a considerable amount of money. On one occasion, the pack containing the cheques and money had unbeknown to Catherine slipped onto the ground since she was carrying many items together. She continued to walk a fair distance when finally she became aware of the situation. She quickly retraced her steps, but had no success in finding the pack. Catherine became distraught, and prayed to Saint Anthony for help. Not only was she concerned about the loss, but she was also worried about being fired from her job as a consequence of the incident. When she failed to find the pack, Catherine had no choice but to return to the office and tell everyone there what had happened. As Catherine began crying one of the girls in the office told her to calm down and offered to come with her and search for the pack. They had gone halfway down the street, when a lady saw them and said to Catherine, “Does this belong to you?” It was the pack containing the money that they had been looking for. The lady had seen the distraught look on Catherine's face and had realised that the item that she had found on the street probably belonged to her. Peter was on holidays near the beach. When he returned from the beach his sandals were covered in sand, so he washed them and put them on the back of the car to dry in the sun. Later on in the day Peter and his wife decided to go for a drive. He forgot about the sandals. They drove for about twenty minutes and then stopped at a roadside store to buy ice-cream. The storekeeper noticed one sandal on the car. He let them know about it and that the other sandal was missing. It was time for their return journey. Their usual custom when starting out on a drive was to say a Hail Mary for their safety. They added another Hail Mary and asked Saint Anthony to help them to find the missing sandal, which they realised had fallen off the car. On their way back when they reached one of the three roundabouts, that they had driven through previously, Peter decided to drive around one of these roundabouts twice. His wife asked him why he was doing this. He answered that he was searching for his sandal. As he drove around the roundabout for the second time, he noticed the missing sandal on the other side of the roundabout. Peter stopped and retrieved it. Saint Anthony was invoked daily by a mother whose daughter was attending Mass but was not receiving the sacraments. To the mother’s relief her daughter came back to the sacraments. Saint Anthony is the patron saint of lost or stolen items and his feast day is celebrated on June 13. Kim was in financial trouble and had debts of about one thousand dollars to pay off. She had no way of doing this and was very worried. Kim made a novena to Saint Philomena for a solution. The bank sent her a statement on an old account which previously had a zero balance in it. She had not used this account in years. There was a balance of one thousand dollars in the account. Kim was confused and telephoned the bank for an explanation. They told her that someone had deposited the money into her account. Kim wanted to know who that was, but no one at the bank knew! She was able to use this money to pay off her debts and to this day many years later, Kim still does not know who deposited the money into her account. In the 1980's an outdoor shrine of Mary Help of Christians was built and blessed in Sydney. Our daughter was three years of age at the time. She had severe autism and could not talk. The man who was in charge of the shrine was a friend of our family. He told us that he had a plan to hold regular gatherings at the shrine, where people would pray for specially chosen intentions such as a person with cancer. He selected our daughter as the first person who would be prayed for. We willingly agreed. It was his hope that our daughter would receive a miraculous healing. On the appointed day, a group of people gathered at the shrine. A Jesuit priest brought our daughter up to the microphone, introduced her to the people and explained to them that she had autism. He asked them to join with him in saying the Rosary for her healing. At the end of the Rosary the priest asked the people to keep this intention in their prayers. There was no instant miracle that day, but in the following years our daughter made spectacular progress. During a long bus trip, Clare developed a very severe cough that was loud and prolonged. The lady who was sitting behind her took out a holy card of Our Lady of the Miraculous Medal and began to silently and continuously pray a devotion that is known as “The Three Hail Marys”, asking for a healing of the cough. Later on, another sympathetic passenger came up to the lady and touched her with a relic of Saint Philomena. The next morning Clare was completely free of the cough. The Three Hail Marys Devotion consists of saying three Hail Marys followed by the invocation "O Mary my mother, keep me from mortal sin.” This devotion is in honour of the power, wisdom and mercy that the Blessed Trinity has infused into the heart of the Blessed Virgin Mary. Many favours have been granted throughout the centuries to those who practice this devotion. A speedy recovery and a change of heart. Susan’s husband Steve was seriously injured. He sustained many broken bones and was in a lot of pain, because of an accident, in which he was knocked off his push-bike by a car. Susan and Steve made a novena for the relief of The Holy Souls in Purgatory, and Steve made a remarkable recovery in a short period of time. Four weeks later Steve’s father was involved in a serious car accident. The Holy Souls in Purgatory were again invoked to help him and he also recovered quickly. Susan’s mother had been cool towards Susan and Steve because of their interest in religion. However her attitude towards her daughter and son-in-law improved a lot, after she saw the wonderful recovery of her son-in-law Steve. Susan’s brother Luke who was twenty-four at the time was also very impressed with the recovery of his brother-in-law. He began taking instruction in The Catholic faith, with a view to receiving the sacrament of Baptism. There has been an improvement in the attitudes of Susan and Steve’s relatives toward religion, after they saw the remarkable results of the intercession of The Holy Souls in Purgatory for Steve. The famous statue which is known as the Infant of Prague was brought from Spain to what is now the Czech Republic in the year 1556 by Maria Manriques. Maria gave the statue to her daughter Princess Polyxena for a wedding present. The statue had been cherished by the members of the Spanish Royal family for many years. Countess Polyxena became a generous benefactress to the Carmelite Fathers when they were given the Church of the Holy Trinity in Prague. This had been a Protestant church, but in 1624 the victorious Hapsburg, Ferdinand II gave the church to the Carmelites and it was renamed under the title of Our Lady of Victory. After the death of her husband, the countess presented the image of the Christ Child to the Carmelites saying, “I give to you what I prize most highly in the world. So long as you venerate this image, you shall not want.” Her prophecy was remarkably fulfilled. When the Carmelite community began to venerate the image of the Divine Child many spiritual and temporal benefits came to it. According to the custom of the Order, the novices fostered a special devotion to the little Son of their queenly mother. Among the novices none loved the Infant more than Brother Cyril. This young religious had suffered greatly from aridity and temptations during the greater part of his novitiate year. However the Infant Jesus restored Cyril's first fervour, and in his turn Cyril became a most fervent client of the Little King. During the depression years a traveling salesman came to my grandmother's house with an Infant of Prague statue which my grandmother purchased. My two uncles who were then small boys came to the door. Among other things the salesman advised them to say three Hail Marys every day in honour of the Infant of Prague and to ask the Infant Jesus of Prague to send them a few sweets every day. This sounded like a great offer because they rarely had any sweets during the depression. They followed his advice and soon afterwards, a rich couple purchased the local hotel. The hotelier’s wife took a liking to the two boys and called them to the fence every day and gave them a few sweets. When my husband and I were flying home to Australia from Rome, I felt stressed by the long tiring flight, and also by the thought of the many plane crashes that had taken place that month. During stressful times like that chocolate is my sedative of choice. (I doubt whether anyone craves broccoli when they are stressed.) I mentioned to my husband how much I needed some. He pulled a face and replied, “Where are we going to get chocolate up here?” Of course I knew that the chances of getting some were not good. Remembering my uncles and their invoking of the Infant of Prague for lollies during the depression (see the previous story), I invoked the Infant of Prague for the much needed chocolate. (I realise that this is not one of the big needs of the world, and that God has much more important prayers to answer, but He is concerned with our smallest needs.) We went down to the back of the plane for a walk, to stretch our legs and to boost our circulation. There was a Maltese man from Sydney there, who was doing the same. We passed the time by having a chat with him. My husband mentioned to him that I wanted some chocolate. When the flight steward passed by, the man told him that I wanted some chocolate, so he went to the place where these things are stored and brought me back some great tasting chocolate with a nice fillings. None of the other passengers on that flight were given these treats! When we were young, my mother was short of money to pay pressing medical bills, so she prayed to The Holy Infant Jesus of Prague and a few hours later a man knocked at our door, and asked if he could buy some of the building wood which he saw in our yard. Mum did not need the wood, so she gladly sold it. The sale proceeds provided money to help her pay for the bills. One of my daughters suffered from a learning disability. She was having great difficulty learning to speak. I made up special speech books for her from cheap second hand children’s picture books that I brought in bulk from church and school fetes. I had exhausted my supply of picture books for this project and wanted to make up some more speech books for my daughter. About that time I read a book about a Benedictine priest of Belgium who lived in the nineteenth century. He was a wonderworker and a zealous promoter of the Saint Benedict Medal. One day I casually prayed to him in these words, "Father Paul of Moll, you are going to have to get me some more children’s picture books or give me some art ability.” After the prayer I went and got a large art sketch book. There was a book in the house which was illustrated with some cartoons of animals doing human activities like cooking the dinner and mowing the lawn. The pictures in the book were small. I sat down and looked at the cartoon book and began to sketch into the art book. I did not stop to look at the drawings that I was doing. When I finally checked my work, I was astounded to see that I had made sketches of professional quality pictures, scaled up to a large size to fit the pages. I have never had this art ability before or since. The two “art” favours detailed above were granted because of a need to carry out specific tasks. The first one was to help with the teaching of a scripture class, and the second one was granted to help with the teaching of speech to a disabled child. These favours were not granted to satisfy an indulgent whim to be artistic. It is appropriate to ask God for art ability, if that is the way that you make your living or have a special need. Many of the favours reported in this book were granted because of special needs. For instance, the mother who was cured of her serious illness, so that she could continue to care for her disabled daughter, the financial help granted to the mother of eleven children, and the calming of the storm at sea to save the life of those on board the ship. Miracles and favours should not be sought to indulge oneself. For example “Lord grant me a big win in the lottery, so that I can buy myself a mansion near the beach.” Petitions may sometimes seem to be similar. Consider the following two petitions; “Lord, please give me a Rolls-Royce.” The unspoken desire behind this petition could be one of pride so that I can show off and impress people as to how important I am. “Lord, please give me a car.” The intention behind this petition might be so that the petitioner can get to and from his job, in an area where there is no public transport. In both cases, God was asked for a car but that is where the similarity ended. It is important to have a proper intention and a proper motive when you ask God for a favour. Your petition should be for a real need not for something to indulge yourself. A friend came down from the city to visit me and after we had discussed many things, we then decided to say a prayer to the Infant Jesus. Our prayer petition asked the Infant Jesus among other things, to protect and bless our temporal goods from loss and misfortune. Sometime during my friend's visit my next door neighbour's house was broken into and robbed of many valuable items. Our house was spared this treatment and my friend and I attributed this to the protection of the Infant Jesus. Every house on the block had been robbed at some time and one of them was robbed twice, even the primary school across the road was robbed. We were never subjected to this. I prayed the Infant Jesus Chaplet frequently. Shortly after I had finished saying the Infant Jesus Chaplet, my son went down to the back shed and sat on an old upholstered swivel chair which was marked for the tip. He put his hand up inside the material which surrounded the arm of the chair and pulled out a twenty dollar note. We were very surprised and then my daughter told us that her nana (my husband's mother who had lived with us until about the time of her death), had sometimes put money notes up the arm of the chair, for what she probably thought was a safe place for hiding. She must have forgotten to remove this one. Our family has received many other kinds of favours from the Infant Jesus (invoked under the title of the Infant of Prague), that are quite different from the ones outlined above. Some of the favours are to do with health; others are connected with catechetical work and many other kinds of needs and problems. The following favours are in relation to friends of mine. There are also some comments which have been made to me about the Infant of Prague devotion. Special note: around the world the Infant Jesus is invoked under many titles including: The Bambino of Aracoeli in Rome, Italy and The Santo Nino De Cebu, (the Holy Child of Cebu), a devotion which originated in the Philippines. The Bambino of Aracoeli and The Santo Nino de Cebu (The Holy Child of Cebu) devotions both have an interesting history. A friend related the following story: she was one of eleven children of a widowed mother. Her mother was always struggling to feed and clothe the family and to pay the bills. On one occasion when there was no money left to meet their needs, her mother prayed The Infant Jesus Chaplet. Later when she swept the rooms in her house some money was found under the carpet to meet their immediate needs. A lady had been suffering for some time from a serious problem with her leg and had been in chronic pain. She prayed constantly about this to the Holy Infant Jesus of Prague. One night she felt a young child's hand rubbing her troublesome leg. There was no one in the room with her. From then on her leg was fine and gave no more trouble. The lady showed her gratitude to The Infant of Prague by giving out many leaflets on the devotion. A friend told me the following story about her grandfather Joseph. Joseph was on a ship off the coast of China prior to WWI. A gale blew up and large waves lashed the ship. The ship was in danger of sinking. Joseph was very devoted to the Holy Infant Jesus of Prague. He went to his cabin and took out his Infant of Prague statue and then stood on the deck and held it while praying. He received a vision of the Infant Jesus walking on the waves. The gale stopped and the waves died down. The ship was no longer in danger of going down. Susan was a woman in her early twenties who was enormously overweight. She lived with her parents. There was great tension between Susan and her parents. She desperately wanted to lose weight and to move out of home. In addition, her father needed a hip replacement operation, but he was terrified to undergo this operation. The reason for this was that his own father, and also his grandfather had died on the operating table and he was convinced that this would also happen to him. She related these facts to me and my husband. Even though Susan was a member of the Anglican Church we told her about the Holy Infant Jesus of Prague devotion. We arranged with Susan that the three of us would do the eight hour emergency novena to the Infant of Prague the following Saturday. The three of us prayed the novena at the same time. A few years later our family moved to a new home and when we returned for a visit to the site of our previous house, we learnt that Susan’s family had moved. One of our former neighbors saw us and we had a conversation with him. He asked us if we had heard the news about Susan. He told us that Susan had lost about one hundred and forty pounds in weight, and that Susan had married. Her father had also successfully undergone a hip replacement operation. Ellen and her husband John, who were inexperienced non seasoned travelers, were going on their first overseas trip to Europe. Most of the trip was going to be with the support of their Australian group, except for the section from Paris to Rome. The Charles DeGaulle airport which they would have to tackle by themselves was a source of concern to them, because neither of them spoke French. In Rome they were going to be met by a friend, who would show them around. When the time came, the group coach driver dropped them off at the wrong terminal at the Paris airport fairly close to departure time. Because of the huge size of the airport it was almost equivalent to being dropped off at the wrong airport. It was a hot day. They had heavy luggage and Paris airport proved to be a confusing place to them. They had limited time to find the right place to go to for their flight to Rome. Before leaving Australia, Ellen who was very concerned about this part of the journey had prayed to The Infant Jesus of Prague, that He would send an English speaking person to help them out at the airport. Now as they could not find the right terminal in that part of the airport, it looked as though the anticipated nightmare was coming true. As time was quickly running out, a lady asked her, "Where do you want to go to?" The lady had overheard Ellen speaking to John in English. Ellen was so relieved to hear this lady speaking in English. They were at the wrong terminal and they needed to catch a bus just to get to the right section. The lady told them that a bus would be along in a few minutes, which would take them to the exact section of the airport that they needed. They made it to the check-in counter with a bit of time to spare. The following story comes from India. My computer laptop adapter got burnt one month ago due to power fluctuations. Due to a sudden high voltage in the power line, the adapter of the laptop started smoking and the next thing I knew it was useless, so I purchased a new adaptor and today the same thing happened; the voltage changed and my new adaptor started smoking. I thought; “not again! I cannot buy other adapter as they are quite expensive.” I made a quick prayer to the Miraculous Infant Jesus and also to Saint Philomena and Saint Anthony, asking them to make my adapter work in spite of all the smoke and burning. I felt a bit silly asking such a thing from the saints. Believe it or not the adaptor is still working! This story was related by a Jesuit priest, at a talk that I attended some years ago. It was told to him by a Hungarian bishop in Rome. In Hungary when the communists were in power, an atheist school teacher did her very best to destroy the belief in God of the children in her class. She was always coming up with devious schemes for this purpose, such as telling the children, that God would take care of the plants. However she made sure that they were not watered. Of course they died, and God was supposed to lose His creditability. Her most devious trick was to ask the children, to call out to the Infant Jesus to come into the classroom. If He did not come in, then He obviously did not really exist. A miracle took place when the children called out in unison, “Baby Jesus come in!” The Infant Jesus did come in! What happened to the atheist school teacher? She suffered an instant nervous breakdown and was placed in a mental asylum. The Hungarian bishop who related this story to the priest, said that the miracle is well known to people in Hungary. Carmel applied for a position with a particular company. She was informed that there were no vacancies available, so Carmel and her husband made a 54 day Rosary Novena. On the 54th day of the novena, as soon as they had finished saying the Rosary, the telephone rang. The call was from the company to let Carmel know that they had a job for her. When I was giving birth my blood pressure went up to a dangerously high level. I was wearing a sacramental which is called the Cord of Saint Philomena at the time. Saint Philomena gave me a special sign that I recognised as coming from her. After this my blood pressure returned to a normal level. A lady who was suffering from bowel cancer prayed to Blessed Teresa of Calcutta. During her last operation the surgeon was astounded to see that there was no cancer left. The feast day of Blessed Teresa of Calcutta is celebrated on September 5. Jan did a large amount of crocheting while watching her children play during the school holidays. Unfortunately she overdid it and as a result pain and inflammation set in. Her neck, shoulders, arms, wrists, hands, fingers, legs and toes were all affected. Some weeks later a request was made for one of the crocheted items from overseas. The item was posted and in due course Jan received a card of thanks from the lady that it was sent to. There was a note on the card which read. “May God bless your busy hands.” All the pain in Jan’s body left her, as soon as she read these words. When Karen went into hospital to give birth to her fourth baby there were many complications. She overheard the doctor saying that she might not survive. Karen was not a Catholic, but she had heard of the Virgin Mary and started to pray to her in the only way that she knew how, by simply talking to her. The next night Karen had a vision of Our Lady holding the Infant Jesus. Karen took this as a sign that Mary was protecting her. The next day she gave birth to a baby girl by caesarean section. Both Karen and her baby were well. A procession was held in India to pray for rain, in order to bring an end to a drought. The people walked and prayed in the procession with rocks placed upon their heads as an act of reparation for their sins. Their prayers and efforts were rewarded with good rainfall. The following story comes from the USA. My daughter's husband is one of the stubbornest humans on the planet. If you want something to happen and he finds out that you want it, it won't happen. I converted to the Catholic faith when my daughter was in high school. She was not interested in joining the church at that time, so I didn't push it. Later on when she had a child, she wanted to join the church, and as my grandson grew, he also wanted to join the church. He went to Mass with us quite often and used to say that he saw angels and saints standing beside the priest during Mass. We all tried to encourage my son-in-law to "let" his family join the Church, but he refused. I went to the religious education sister in my parish and talked to her. She recommended prayer and suggested a novena to Our Lady. I began the novena and prayed it daily for three years. In addition to this, after the death of Pope John Paul II in April 2005, I also said a daily prayer to him for the intention. One day, out of the blue my son-in-law stopped by my house. He grabbed a coke and sat down at my kitchen table. I talked to him about various things. He asked me if I was on the RCIA team at my parish. When I told him that I was, he asked me if I could set up a meeting with the priest for his family to seek instruction in the Catholic faith. I was completely stunned. There is no other explanation for his change of heart, other than the intercession of Our Lady and The Servant of God, Pope John Paul II. (This took place in November, 2005.) They joined the classes and were baptised and taken into the church at Easter the next year. After the Mass that night, I told the religious education sister that I had taken her advice and prayed a continual novena for the three years since she had suggested it. She just smiled and said "of course, that is everyone's secret weapon!" Since then they have had another son. He was baptised at eight weeks of age. What a joy for my husband and I! Michele had recently converted to Catholicism after having been a Protestant all her life and she was still trying to understand Catholic things. She thought “I am going to give this saint thing a try.” Michele was looking for a notebook. She went to the bookshelf and hunted there to no avail. So Michele asked Saint Anthony, “Okay, where is this notebook?” Then she heard the words, “Fourth shelf on the bookshelf.” Her thoughts were, “Yeah right, I have just looked there.” So Michele went into the office and began looking and it was not there. She thought “This is wrong”. Then Michele heard the words, “I said the fourth shelf.” Michele counted the shelves and discovered that she was actually looking at the third shelf, so she looked at the fourth shelf, and there was the notebook. This incident convinced Michele of the value of praying to the saints for assistance. On another occasion Michele prayed to Saint Anthony for three days in a row to help her find two items of clothing. On the third day she made this prayer: “Saint Anthony I have asked you for three days to find these items, would you please take me to where they are?” After making this prayer Michele went out to the yard to attend to some jobs. She then came back into the house and decided to look in the closet one time for the items. Michele opened the bedroom door and as she walked in, the thought came to her “Turn around and look on your bed” and there were the two items of clothing neatly folded and laying at the end of the bed. Michele was astounded because she had slept in that bed and had made it that day and on the previous day! Vandals kept coming to an alley and putting graffiti up on the walls. The local council had to spend time, money and effort to clean it up on three occasions. David went down to the alley and prayed to Our Lord and asked Him to cover the alley with His Precious Blood and to send angels to protect the alley. The vandals did not come back. When Sue was dating Brad (her future husband), she was not sure if she could go off the birth control pills that she had been using for five years, since the age of sixteen (for the purpose of pain relief.) Sue had really bad cramps and the pills alleviated the pain. Brad knew of her dilemma. He was thinking of marrying her, but he did not want the use of this drug in the marriage, because it is often used for contraception. Brad prayed a novena of the Rosary for the intention that; when Sue stopped using the pill, that her cramps would not return. Our Lady granted Brad's request. When Sue was a teenager, she would be in bed for two days with pain every month, but after Brad said the Rosary novena, Sue was pain free and has continued to be pain free every month since then. I used to maintain a newsletter mailing list. On one occasion a nun telephoned to inform me that Sister Philomena had died and asked me to remove Sister Philomena’s name and address from the mailing list. There were two Sister Philomenas on the mailing list. I deleted the address for the wrong one from the computer file, and to make matters worse, I used white typewriter correction fluid to remove the same entry from the printed copy of the mailing list. Later on I became aware of my mistake and realised that I could not get the address back, because it had been totally removed from all records both printed and electronic. I prayed to Saint Philomena for a solution to this seemingly impossible situation, and then an idea came to me. I took the page that had the typewriter correction fluid over the printed entry, turned it to the blank side of the paper and then held it up to a strong light, so that the light would shine through that section of the paper. This enabled me to see the address, however the letters were all reversed. I carefully copied down the reversed letters and then wrote each one of them down in the correct order and succeeded in getting the address back. In a television program that I saw recently, it was mentioned that forensics experts did something very similar to this. They shone a laser light through the back of a diary page, where an entry had been covered up with typewriter correction fluid and retrieved the entry. Judging from this, Saint Philomena obviously knows forensic investigation techniques! During a pilgrimage to Catholic shrines in Italy and France, we visited the ruins of Pompeii (the ancient Roman city which was destroyed by an eruption of Mt.Vesuvius in 79 AD.) In the distance we saw the Basilica of Our Lady of the Rosary of Pompeii, (the famous church which is associated with the devotion that is known as the 54 Day Rosary Novena, which was revealed by Our Lady to an Italian girl in the nineteenth century.) Everyone in the pilgrimage group wanted to visit the basilica. The coach driver and the tour guide firmly refused our request, because of their time schedule. No amount of pleading with them helped. One of the passengers, who has a strong devotion to the 54 Day Rosary Novena, silently made this prayer to Our Lord, “Dear Jesus, our group would like to visit the basilica. Please let Your Will be done in regard to this matter.” The coach driver and the tour guide changed their minds and we had the joy and privilege of visiting the famous basilica. Richard suffers from pain in the hip due to arthritis. He sometimes has to write many letters for his organisation. Whenever Richard sits down to do this he gets lots of pain in his hip and has trouble standing up and walking afterwards. Richard was given some oil blessed in honour of Saint Raphael the Archangel, who is known as the healing angel on account of the many spiritual and physical cures that he obtains for people. On one occasion Richard had a lot of letters to write, and before sitting down to write the letters he blessed himself with the oil and prayed to Saint Raphael for healing. Richard wrote the letters and contrary to what usually happens, he had no pain and was able to walk well afterwards. (Raphael means medicine of God.) Saint Raphael’s feast day is celebrated on September 29. A young mother of two small children related to me that she was forced to work at the local greengrocer shop to pay for her weekly fruit and vegetable bill because her husband was an unemployed alcoholic. He was wasting a portion of their very limited income each night on a bottle of hard liquor. I gave her a book entitled Saint Philomena the Wonder Worker and a novena to Saint Philomena, which she gratefully accepted. About a week later I asked how things were going for her. The answer left me stunned because I had not expected problems of that magnitude to be fixed up so quickly. Her husband had stopped drinking and he had also obtained paid employment doing sign painting on shop windows. Dana was diagnosed with a generalized anxiety disorder. This is a debilitating condition in which the sufferer is very anxious and restless all day long and is unable to focus on anything, even something simple such as reading. One day Dana attended Mass and afterwards when everyone had left the church, she poured out her heart to Our Lord in the Blessed Sacrament, telling him that she felt lost and confused and did not know what to do about it. When Dana was leaving the church, the thought came to her that she should not focus on her illness and on how to get rid of it, but that she should focus only on Jesus. This was a turning point in her life. She was flooded with peace and relief in a much better way than any medication could have helped her. A lady came to my house. She was selling cleaning detergents in support of a charity. We had a chat. She told me that she suffered from constant migraine headaches. I asked her if she would like a book and a novena card on Saint Philomena and explained that this saint is a great miracle worker. Even though the lady is a member of the Anglican Church, she willingly agreed. A year later the same lady returned and I recognised her and asked, “Aren’t you the lady that I gave a Saint Philomena book to?” “Yes” she replied. I then asked her if she had prayed to Saint Philomena. The lady told me that she had prayed to the saint and that her migraine headaches were healed. In addition she said that she had asked Saint Philomena to improve her ten pin bowling score and this was also granted. Tina fell and broke her hip. She offered this suffering to Our Lady for the success of the work of a local group of the Legion of Mary. At that time it had eight members. Now it has grown to over fifty members. Joanne a member of the Uniting Church related to me that her twenty eight year old daughter was dating a man who was of bad character. The problem was that the girl was overweight and lacked confidence. She feared that if she dropped this man that no one else would want her. I encouraged Joanne to pray to Saint Philomena. This she did and in a short time, her daughter dropped the undesirable boyfriend and found herself a much better man and lost weight as well. A friend of mine, who is a member of the Lutheran Church, was suffering greatly from a problem connected with her teeth. She had already consulted a dentist, who told her that there was nothing that he could do about it. Since there was no help from the dentist, I told her about Saint Appollonia, the patron saint of teeth, dentists and toothaches. This was opportune since Saint Appollonia's feast day was coming up in a few days. She took the advice to pray to Saint Appollonia and when she returned to the dentist he was now able to come up with a good solution to fix the problem. Saint Appollonia was an elderly Christian lady who had all her teeth knocked out during her martyrdom. Her feast day is celebrated on February 9. A young boy of about four years of age was suffering from vertigo attacks. (This feels as though the room is spinning very quickly around the person. This can be a terrifying experience even for an adult, so it is hard to imagine how a young child would cope with it.) He used to cry out in terror: “The room is falling down.” His mother asked every priest that they met to bless her son. He was healed of the vertigo. In WWII during an air raid in Germany* a mother quickly grabbed her baby and placed him into the pram. She wanted to get to the air-raid shelter as quickly as she could, however outside the snow was very thick and the pram could not be pushed along. During this stressful time a man appeared and told her that all would be well. He then disappeared. All the difficulties immediately dissolved and she was able to push the stroller along and safely arrive at the air-raid shelter. She believes that the man who appeared is her guardian angel. During the winter months when it snows, icicles form on the windows. Children enjoy eating the icicles. Jen ate some of these and became very ill. She was off school for three months and developed a form of epilepsy. Her father took her on a pilgrimage to the tomb of Blessed Peter Barbaric of Croatia and made a vow that he would fast every Thursday for the rest of his life, if Jen was healed. From that day she never suffered from epilepsy ever again. Jen’s father faithfully kept the vow. A few years ago I was teaching scripture at the local state school. Because I was running late, I did not go to the school office and sign the register, but went straight to the classroom and waited for the bell to ring and for the students to come in. There was a strange quiet feeling in the room and something seemed very odd. I waited for more than fifteen minutes for the students and wondered why they were so late in coming to the class. I decided to do some preparation work for the class while waiting and took a guardian angel holy card out of my bag and wrote the words of the guardian angel prayer on the back. As soon as I finished writing the prayer, I decided that since the pupils were twenty minutes late for a thirty minute class that I would leave and go home. When I went out to the playground, I noticed with surprise that the whole school (teachers, students and secretarial staff) were way down the back of the field. I went down to see why. There was a serious gas leak in the school and everyone was supposed to be evacuated! No wonder it felt quiet and strange in there, because no one was in the school except me! No one could go back into the school to telephone parents, to collect bags etc. My daughter (who was a student at the school) was very worried when she could not find me in the assembled crowd and mentioned to the teacher with some concern, that I was coming up to teach scripture and should have been present. Since the principal deemed that it was too dangerous to continue, school lessons were abandoned for the rest of the day and my daughter was the only pupil in the school who could go home straight away! The following incident took place when I was eight years old. I was crossing the road, a car was coming towards me and the driver braked hard to avoid an accident. The car managed to stop, but it came so close that it touched the skirt of my school uniform. Afterwards I caught the bus home. By the time I arrived home, my mother, to my great surprise, already knew about the incident even though it had taken place several miles away. Someone had obviously seen the incident and telephoned her with the information. On another occasion when I was an adult, I got off a bus, and started to cross the road. When I had gone halfway across I tripped and fell down. There was lots of fast moving traffic flowing past me, including semi trailers swishing past very close on either side. I could feel the force of the wind that they generated as they passed by. Unfortunately I was stranded there for a considerable time unable to cross the road. Eventually, the traffic cleared and to my great relief I was able to safely cross to the other side of the road. I was walking my children home from school. We stopped at the corner of the street in order to cross the road. There was a car stopped there waiting for the traffic to clear in order to make a turn. I deliberately made eye contact with the driver to make sure that she could see me. The lady appeared to be looking at us and acknowledging our presence. We then confidently proceeded to cross the road. Unfortunately despite this she had not seen us. The vehicle started to move and accelerated towards us as we began to cross the road. The car was almost upon us when at the last second she managed to slam on her brakes missing us by a tiny amount. The lady got out and started to shake and cry uncontrollably, because she realised that if we had been killed, that it would have been her fault for not paying enough attention to the situation. My obviously pregnant state would have added to her distress. I thought very little of the incident at that time, and casually remarked to her “It’s okay, I pray to the guardian angels for protection, everyday." A lady who witnessed this incident told me the next day that, she was absolutely convinced that the children and I were going to be killed. One Saturday morning, I took a walk near my home. Our neighbor’s dog (a ferocious German Shepherd) came tearing down a long driveway towards me. He started to menace me. Unexpectedly a car came down the road. It was practically the only car that had driven down the road that day. There were two sisters in the car, when they saw what was happening and the danger that I was in, they quickly opened the car door, and told me to get in. This undoubtedly saved me from a vicious attack by the dog. I am sure that God arranged to send these two ladies at just the right time to help me. The following account suggests the intervention of a guardian angel. During a religious festival in Malta, a six-year old boy named John picked up a firecracker, because he thought that it was unlit, he placed it in his front trouser pocket, straight after that, a man came up to him and told him that the firecracker in his pocket was lit and to throw it away. John immediately complied and the fire cracker exploded as soon as it hit the ground. John then turned back to thank the man, but amazingly there was no one there. Protecting people is not the only thing that guardian angels do. The mission of a guardian angel is to help you to reach heaven, however they can assist in many diverse situations both spiritual and temporal. They are even willing to give help in the trivial events of life as the following favour demonstrates. John tried for many hours to reach his wife Terry on the telephone. He worked out that the phone was off the hook. There was not much that John could do about that. Then a little inspiration came to him. He instructed his guardian angel to ask his wife's guardian angel to get her to put the phone back on the hook. Immediately after this prayer, his wife put the phone back on the hook and John successfully telephoned her. The feast day of the Guardian Angels is celebrated on October 2. This story is told as it was told to me (editor’s note.) When I was returning home from a session at university, I walked along the edge of the road next to the footpath, because there was such a large crowd of people on the footpath itself. I had just finished praying the Chaplet of the Divine Mercy when I got an inspiration to jump up onto the edge of the footpath. If I had done this only a split second later I would have been run over by a city bus. The bus came so close to me, that even though I was on the footpath, I scraped off the dirt along its side as it brushed past me. The driver stopped to see how I was. He gave me the excuse that he was trying to avoid bumping into a car on the other side of him and that I shouldn't complain, since I had not been walking on the footpath! After he said that, he realized that he was admitting that it would have been better to run me over than to put a dent in the other car! I thanked my guardian angel. I very often ask him and thank him for his protection. He has saved me on many other occasions. I give him so much work! I prayed to Saint Philomena to help me to find a good name for my new website. I then remembered the Californian Spanish Franciscan missions and their mission bells which call people to prayer and also a 60’s hit song named “Mission Bell”, so I settled on Missionbell. Later that day I went up to the state school to teach Catholic scripture to the kindergarten class. It was late in the school year. The children had been told my name many times and knew it well, yet one of the little girls asked me what my name was. I asked the other children if they knew and could tell her. Immediately one little girl jumped up and said that my name was Mrs. Bell. This does not even come close. On hearing this, another girl jumped up and even more astonishingly proclaimed that my name was Missionbell. I am puzzled as to how a five-year old Australian girl would have ever heard of the word Missionbell. Saint Philomena was confirming for me in this remarkable way that the name Missionbell was the one that she wanted for my website. Richard was scheduled for a hip replacement operation, but before it was due he was diagnosed with an infection in his teeth. Because of this the hip replacement operation was postponed. The doctor said that he could not operate until the infection was healed. Richard daily put oil blessed in honour of Saint Raphael on himself. He can now walk without pain and no longer needs a walking stick. In addition to this, antibiotics have healed him of the infection in his gums and teeth. A lady in the USA asked an on-line friend to place some petitions at the shrine of Blessed Mary MacKillop in Australia. One of the petitions was for her twenty-eight year old daughter Lyn to find a good husband. A few days after the petition was placed at Blessed Mary Mackillop’s tomb, Lyn's mother received a telephone call from a man that Lyn had dated eight years ago. Lyn and her former boyfriend went on a pilgrimage to Lourdes, in France to pray there to discern God's will for their lives. They have since married. Another of the mother's petitions to Blessed Mary MacKillop was also answered. Her son decided to give up living with his girlfriend. They started to attend Mass regularly and also began making preparations to marry. I had arranged to go on a pilgrimage to the shrine of Blessed Mary MacKillop at North Sydney. On the morning that I was due to go I discovered that my microwave oven had stopped working. When I went to the shrine I prayed for many important petitions. I also mentioned to Blessed Mary MacKillop the little matter of my microwave oven. When I arrived home I tried my microwave oven again and it was still not working. After this I slammed the oven door very hard and to my joy the microwave started working! It seems that the only thing that was wrong was that there was a fault in the closing mechanism of the door. The microwave oven was not fully closing. It only appeared to be fully closed. A friendship between two formerly good friends seemed to be in tatters, because of inaccuracies which were presented to one of the friends about the other. The friend who was the subject of the stories understood what had happened, and for nearly two years, she tried to be friendly with her former friend, showing good will, by sending Christmas greetings and other messages. Despite this, no response was received from her former friend, so she visited the shrine of Blessed Mary MacKillop and said a short prayer there about the matter, but realised that the situation by now was looking hopeless. Fifteen days later to her great joy, she received a message from her former friend that was full of good will towards her. Blessed Mary MacKillop was beatified on January 19, 1995 in Sydney, Australia by Pope John Paul II. Her feast day is celebrated on August 8. She will be canonised on October 17, 2010. Saint Denis is the patron saint of Paris and of headaches. I knew that Saint Denis was the patron saint of headaches, but I did not know the reason why. When my husband and I were visiting Montmartre, the site of the martyrdom of Saint Denis in Paris, where the Sacre Coeur Basilica is located, I started to develop a headache. Our guide told us the story of the martyrdom of Saint Denis. After he was decapitated he miraculously picked up his own severed head, carried it and washed it! The connection between Saint Denis and headaches was now obvious. There were some headache tablets in my carry bag, but a search failed to find them because there were so many items packed in there. I invoked Saint Denis to heal me of the headache. We had a nice meal and then I felt much better and the headache was gone. This was a small favour, but a welcome one, as anyone who has ever had a severe headache would know. The feast day of Saint Denis is celebrated on October 9. Dawn was suffering from infertility. After she prayed to Saint Anne for help the prayer was answered. Dawn gave birth to a baby girl. Saint Anne is the patroness of women who are suffering from infertility. Her feast day is celebrated on July 26. A very sick mother was greatly concerned because there was no one to look after her disabled daughter. She prayed to Our Lord and she says that He appeared to her in a vision and healed her of the sickness. The healing of her sickness was later medically verified. A meeting was held in the church, because unfortunately, the parish did not have anywhere else to hold it. One of the ladies attending the meeting commented on the inappropriateness of the situation. The priest suggested that the parishioners be asked to donate towards the building of a meeting room. The lady said that she would give a good donation. Later when she informed her husband about this, he said that they did not have enough money to make such a big donation. She prayed to Our Lord and to Our Lady for help to fulfill the commitment, sometime later her husband found an expensive gold ring set with diamonds which someone had lost. They handed this ring to the police who informed them, that if no one claimed the ring within a three month period that it would be given back to them. After the three months had elapsed and no one had claimed the ring they received it. The lady then took the ring and sold it to a pawnshop for eight hundred dollars and donated the money to the parish towards the building of a meeting room. Linda had a large cyst on the side of her face. People kept commenting on it. Her doctor suggested that she have plastic surgery to remove it. Linda prayed a novena for the relief of the Holy Souls in Purgatory. The cyst gradually went right down. There was no longer a need for surgery. For five months I was suffering from severe panic attacks, which caused some very big problems in my life. I was very upset and prayed many prayers for help, including a 54 Day Rosary Novena. One of the prayers that I said was the prayer associated with the Miraculous Medal, "O Mary conceived without sin pray for us, who have recourse to thee.” Our family went on holidays for a month during this difficult period. There was a doll museum in the holiday area which I wanted to see. It was very interesting to see all the different kinds of dolls, but two interested me more that the rest. There were two dolls that were dressed as nuns and one of them had a Miraculous Medal at the end of her Rosary beads and the other was wearing a Miraculous Medal. This unexpected find was very comforting to me and I recovered soon after from these panic attacks, which were connected to specific circumstances. The previous batch that I had suffered from, were related to crossing bridges (fear of heights.) They lasted many years and were healed as a result of a lot of prayers. The recent panic attacks were far more severe than the previous ones, since due to their severity I sometimes vomited. An underlying longstanding ear imbalance problem made these panic attacks unusually severe. Thanks to Our Lady of the Miraculous Medal they were healed within a few months. During one of my pregnancies some of my ligaments had softened up in preparation for childbirth. This caused me a fair bit of pain. The pain had been occurring for several weeks. One night my husband and I went to a Mass which was celebrated according to the Maronite Rite. When I went up to receive Holy Communion it was obvious to many people that I was in pain, because they could see the way that I was limping. After the Mass a group of ladies approached me and said something in Lebanese, (a language which I do not speak) and they then ushered me over to a side chapel. They prayed in front of a large picture of Saint Charbel and doused me with water from a baptismal font that was in front of the picture. The next night we attended Mass at the same church. All the pain had gone. This was also apparent to people by the way that I walked when going up to Holy Communion. After the Mass the same group of ladies approached me and again ushered me to the chapel of Saint Charbel in order to give thanks for the obvious healing of my pain. In one of my kindergarten scripture classes a small boy used to cry every week for his mother. This made it difficult for me to teach the other children. In order to try and stop him from crying I decided to have a talk with him. I asked him what his name was. He told me it was Charbel. At the time I was wearing a locket containing a relic of Saint Charbel. There was a picture of the saint on the front of the locket. I showed it to him and asked him “Do you know who this is?” His face lit up with joy. “It's Saint Charbel!” He exclaimed. He never cried in my class again. The feast day of Saint Charbel is July 23. The Saint Benedict medal is one of the most famous and efficacious medals in the church. It commemorates Saint Benedict working miracles through The Sign of the Cross. The blessing formula for the medal has a special exorcism blessing against all things coming from Satan and the evil spirits. It also has a special blessing for the sick. Jill lived next door to a house that was rented out to tenants. Three successive groups of tenants lived in the house. The tenants in each of the three groups were drug addicts. They usually slept all day and stayed up all night disturbing the neighbours with their noisy rowdy parties. The third group of tenants skipped through without paying the rent. Jill's mother then placed a blessed Saint Benedict medal beside the house, after that much quieter tenants moved in. Kim has a similar story. She placed a Saint Benedict Medal close to a house across the road from her own home. The tenants in this house used to blast the neighbourhood with unbearably loud music. After the Saint Benedict Medal was placed there, the tenants moved out and quiet peaceful tenants moved in. Every Friday night my husband and I went to the supermarket to buy supplies for the family. The supermarket staff always put over the loudspeaker, a heavy metal rock radio station. This caused me to develop headaches during the shopping excursions. After many weeks of this I came up with the idea of placing a tiny blessed Saint Benedict medal behind the cans of food. Saint Benedict took care of things. The following Friday when we went to the supermarket, there was a much better radio station (which played pleasant enjoyable music) coming over the loud speaker. Gail’s father works as a policeman. He was under constant stress because of the trouble that he was having with a senior police officer. The senior police officer was very argumentative and troublesome. The problem had been ongoing for about a year. Gail gave her father a blessed Saint Benedict medal and said a prayer for him, starting from the very next day the senior police officer was much easier to get along with. While Melanie was working at the back of her house doing the laundry, she said a prayer to Saint Benedict asking him to protect her home. Ten minutes later there was a knock at the front door. It was a man who alerted her to a fire in her front yard, which had been started by someone carelessly throwing away a lit cigarette. The fire had already started to spread. There was no tap in that area, so she ran back into the house to get a bucket of water. By the time she got back, a man who was passing by, had put out the fire with his work boots. Without his help the fire could have caused considerable damage. The feast day of Saint Benedict is celebrated on July 11. A friend of our family lived near a park. For many years hoodlums gathered in the park at night, where all kinds of unacceptable behaviour took place. The police were called repeatedly over a number of years and despite their efforts they were never successful in improving the situation. Finally our friend placed a blessed Saint Benedict medal under one of the park benches. From that day on the hoodlums never returned. The “roses” that Saint Therese referred to in the prophecy quoted above: is the term which she used to describe her miracles and favours. The feast day of Saint Therese is celebrated on October 1. My aunty was diagnosed with breast cancer. I went to her home with a first class relic of Saint Therese. Her daughter-in-law said that my aunty and uncle were attending Mass at the parish church. My husband and I then drove down to the church. Mass has just ended. I looked down the hill, and I could see my aunty and uncle leaving the church. As soon as I saw them I smelt the heavy scent of roses. There were no roses nearby. Saint Therese was giving a sign that all would be well. My aunty underwent chemotherapy and surgery, which was successful in eradicating the cancer. (It is a well documented fact that Saint Therese sometimes allows people to smell roses in connection with her favours and miracles.) Special Note: First class relics are part of the saint’s body e.g. bone. Second class relics are objects which belonged to the saint during their lifetime e.g. clothing. Third class relics are touched to the saint’s body or tomb after their death e.g. cloth. Maree was trying to choose a saint's name for her Confirmation. She asked her mother for help with this. Her mother gave several suggestions of saints' names but Maree rejected all of them. Then her mother wrote down the names of many female saints on strips of paper and placed them in a box. She told Maree to invoke Saint Therese to help her draw out the right name. Maree drew out Saint Helen, the mother of the Emperor Constantine. She was not pleased with this result, so her mother asked her to put the name back into the tin, and let her draw again. Again she pulled out Saint Helen. Maree wanted one more try. Yet again the result was Saint Helen. Finally she asked, "Why does Saint Therese want me to have Saint Helen?" The matter was settled. Helen was chosen as Maree’s Confirmation name. My daughter was happy with her job, however there was some difficulties regarding going to and from the job. My daughter had to catch a train to and from the workplace and she also had to take her push bike on the train with her. When she arrived at the destination railway station, she then had to ride her bike down a long road in a relatively isolated area, where she was in danger because of speeding traffic including semi trailers. We prayed for some time for her to find another job, but to no avail. Finally I gave her a novena to Saint Therese. She prayed the novena and some time later, she came home with some roses that she had found at the railway station. Later on, she found a job in a much better location. Roses are one of the signs that Saint Therese gives when she is granting favours to people. Anne suffered panic attacks whenever she saw mice. This was a lifelong problem so she prayed to Saint Dymphna for help. One day when she was standing barefoot on the carpet, she felt a very strange sensation on her foot. She looked down and there was a little mouse scampering across her foot. It struck her immediately that she had not gone into a panic attack from the unpleasant experience. From that time onwards she was no longer afraid of mice, although she never grew fond of them. The feast day of Saint Dymphna is celebrated on May 15. She is the patron saint of those who suffer from mental illness and nervous afflictions. When I was expecting my fourth child, I prayed to Saint Gerard Majella for help with the birth, since the other births had been difficult and painful. This time it turned out to be short and easy with almost no pain. I was amazed and kept asking myself “Is that it? Is that all there is?” The feast day of Saint Gerard Majella is celebrated on October 16. He is the patron saint of mothers and babies and protects mothers during childbirth. One of the consequences of Original Sin is that childbirth is a painful business. Saint Gerard Majella’s intercession in this case shows an example of the Mercy of God towards the human race. "Suppose you prayed very hard to get the ideal babysitting job that you have been wanting and then someone calls you out of the blue and hires you on the spot to baby-sit for good pay, and it turns out to be an easy job and the kids are really good. Wouldn't you say that was like a miracle as you've been thinking that it would never happen?" The next day, Wendy came home from school very excited and said to her mother; "Guess what, Mom! boy, do I believe in God!" "What happened?" her mother asked. Wendy replied "Remember how we were talking about Divine Intervention yesterday? Well, my teacher said a woman called the school looking for a mature 6th grader to baby-sit. She asked me if I would be available to walk a 2nd grader home from school twice a week, stay with her, help her with her homework and baby-sit until her Grandmother comes home from work. She's going to pay me fifteen dollars a day! And the clincher is, she lives a block away from our house!" Wendy kept that job the whole school year and was extremely happy with it. She learned a lot about responsibility and what praying can do! Joseph had a brain tumour which was due to be operated on. He stopped off on his way to the hospital where he was due to have a pre-op, to be prayed for by a group of people, who also put Lourdes water on him. When he was examined at the hospital, the brain tumour was gone. In another case an elderly priest, washed his eyes with Lourdes water, and received an improvement in his eyesight. A few years ago my daughter's dog Maxi went missing. My daughter was ten years old at the time and was devastated by the loss. After three days I suggested that we pray to Our Lord that; either Maxi would return home or that we would find him. We were sitting in the dining room. The back door was open but the screen door was closed. As soon as we finished the prayer, right after we said Amen, we heard a scratching sound on the screen door. It was Maxi letting us know that he wanted to come in! Was this a choir of angels? During a trip to the city, three sisters decided to visit a nearby church and as they walked into the church's vestibule they heard a choir singing. The singing sounded angelic. The sisters refrained from going into the church because they did not want to disturb the choir. After waiting for some time they decided to walk into the church, because their time was running out and they would soon have to leave and catch their train home. As they walked into the church the singing stopped and to their amazement the church was empty. My daughter was born with severe autism. She was still unable to speak at the age of three and a half. I turned to Saint Jude for his help and went to Holy Communion for eighteen consecutive Saturdays in his honour, to obtain a healing of the autism. At the end of the eighteen weeks my daughter's condition became even worse. I was in a panic. I pulled myself back together and continued to pray to Saint Jude and to other saints for a healing. My daughter learnt to speak well and has made such astounding progress that people find it hard to believe when I tell them that she was born with autism.Saint Jude is the patron saint of hopeless cases. His feast day is celebrated on October 28. Stephanie informed her mother Clare that she was going to be married in three months time. Clare was very short of money. She realised that there was no way that she would be able to provide Stephanie with a decent wedding reception. Clare turned to Saint Jude, the patron saint of hopeless cases, for his help. She won a modest amount of money in the lottery and this was sufficient to cover the costs involved. Bushfires were headed towards the homes in a mountain area. One of the home owners stood in front of his house, which was in the path of the fire and prayed the Rosary. The wind changed direction and the houses were saved. Some years ago, there was a period when it rained almost continuously for ten weeks. This made it difficult for people to get their washing dry. On one occasion because everything was still drying, I literally had no jumpers (known as sweaters in the USA), left to clothe my children with. The weather was cold, so this was needed. It was time for them to walk to school and all that I could do was say a prayer for some help in the matter. I prayed the prayer to Our Lady of Mount Carmel, the Flos Carmeli, (The Flower of Carmel.) After saying the prayer, I opened the front door. There on the verandah was a cardboard box filled with clean ironed jumpers, slacks, jeans and blouses. I later learned that they had been put there by a lady who lived in the next street. She had received them from a cousin and had no need of them. This gift was the answer to my prayer. 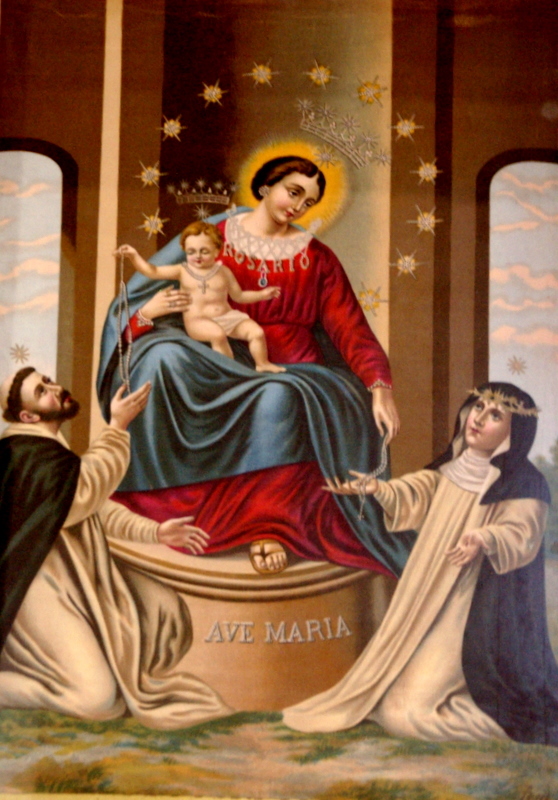 The feast day of Our Lady of Mount Carmel is July 16. Lisa was suffering from a lot of pain in her arm for a period of six months. The treatments that the doctor tried did not alleviate her suffering. Lisa could not lift her arm up to get things off the shelf. This was particularly troubling because at that time, she was working in her family owned grocery store. The doctor said that he thought that she might have damaged a nerve in her arm. Before going to sleep one night Lisa prayed and made a promise that if she was healed, that she would send a quantity of olive oil to a Marian shrine in Lebanon. (This oil is blessed at the shrine and then distributed to the sick who receive healing through its use). The next morning she woke up completely healed of the problem. Michael was in urgent need of employment. He had mortgage repayments due in two weeks time. Michael sent his résumé to a company in the hope of getting a particular position there. He telephoned his mother and asked her to pray that he get the position. His mother started a thirty day novena to Saint Joseph for the intention. Halfway through the novena Michael telephoned his mother in great distress. He told her that he had blown the interview. His mother told him to hang on because she had not yet finished the novena. The company called Michael in for a second interview. They recognised his ability and gave him a much better job than the one that he had applied for. It also had a higher salary. Michael was sent to America to set up computer systems for the company. This was the first time that Michael’s abilities had been recognised and financially rewarded by any of his employers. Alana was suffering from severe arthritis and was in so much pain, that she could no longer raise her arms above her head. She could not fix her pony tail, so she decided to have her hair cut short. So severe was her condition that she needed help from other family members to remove her dress in order to change her clothes. On one occasion none of the members of the family were available to assist her, so she was forced to use a pair of scissors to cut her dress, so that she could remove it in order to change. For several months Alana recited the following prayer: By His Wounds we are healed. This prayer is a quotation from Isaiah in the Old Testament of the bible. It refers to the sufferings which Our Lord was to undergo. Through this prayer she was healed of the arthritis. These two invocations were taught by Our Lord to Sister Mary Martha Chambon, who died in the Visitation of Chambery, France, on March 21, 1907. The sister received from Our Lord a double "mission", to constantly invoke the Holy Wounds herself and to revive this devotion in the world. Promise of Our Lord to Sister Mary Martha: "I will grant all that is asked of Me by the invocation of My Holy Wounds. You must spread the devotion." The following story is related by a priest. It is told here in his own words. This is the story of how St Philomena healed my wrist. I owe our little saint a great deal. Here in the US health insurance is very expensive and medical treatment is even worse, ($30,000 for an overnight stay after Angioplasty!) so my budget could not afford the $300.00 a month for health insurance. The car that hit me took off, so I could not even make a claim there. A friend took the first x-ray for free. It was creepy seeing the bit of bone split off and sticking out. We have a tiny shrine to Saint Philomena in the chapel and I place small bottles of olive oil on the shrine and then give them out for healing. One Sunday, I took off the brace that I had been wearing and publicly anointed my wrist, stating, “If I am not healed, then I won’t look foolish, she (St Philomena) will.” The next two days it really began to hurt, which caused me to finally give in and go to the emergency room ($500.00 by the way.) They took the second x-ray and packed me off to an Orthopaedist. He was quiet irate after comparing both x-rays, as he said that the first x-ray must have been taken thirty years ago, because the second x-ray showed total healing, which is quiet impossible after only a couple of weeks. The big problem with this doctor’s conclusion was the fact that the x-rays are automatically date stamped when they are taken! So he bundled me out of the office and did not send a bill! (which in this country is probably more miraculous that the healing!) St Philomena can be called upon for anything. She really is “powerful with God.” Editor’s note: The prices mentioned in this story were those for the year 2001. The x-rays were sent to the shrine of Saint Philomena in Italy. Kelly’s water supply was disconnected because she owed the water company a lot of money. Kelly made small monthly payments, but it never made any difference because of the penalty rates and the interest charges. She was getting further and further behind. The company sent out a man to disconnect the water. You can live without many things but water is not one of them. It was then that Kelly remembered that Saint Philomena is a saint who can help out in impossible cases. She prayed to Saint Philomena and shed some tears as well. The man who had disconnected the water then came back. She asked him was happening and he said that he had NO idea. He said that while he was working on another job, he received a new work order to come back and reconnect the water supply. Kelly had never believed in miracles and answers to prayer, at least not for herself. These things always happened to other people. Saint Philomena changed Kelly’s outlook and strengthened her faith more than she thought possible. Barbara made a novena to Saint Philomena for her husband. He needed to earn enough money to get their family out of debt and at the same time to eliminate the need for his second job delivering newspapers every morning. He had been doing the newspaper run for five years. He would get out of bed every morning by 4.30 and deliver the papers, before going to his regular office job. Barbara had heard of Saint Philomena from a friend, who gave her a prayer card. Another friend found a book on St Philomena at her father’s house and lent it to Barbara. She read it and felt like she knew more about this wonderful little saint. A month after Barbara finished the novena, her husband got a call from a personnel officer about a vacancy for a Manager position. He interviewed with the company and was offered the job. He then went to resign from the company that he had worked with for the past ten years. They said they could not afford to let him go and that they would beat the other offer to convince him to stay. They added to that higher salary a huge lump sum bonus of $40,000. That was what was needed. to get their family out of debt; their second mortgage, car loans, and credit card were paid off in full. There was even enough left to get a new roof for the house. The following account was received on received on email: For the past three years, I have had a staff member in our hospital, who was uncooperative with almost everyone else on the staff. I have been praying for her all these years, as well as for the rest of the staff. Beginning in February of this year, I started praying for the Holy Souls in Purgatory and asked them to find a peaceful solution to this matter. It did not take long, she resigned. Jane’s parents had been married for almost six years with no sign of a pregnancy. They tried everything available to them in the fifties; complete medicals, consultations with specialists, charting temperatures – you name it. They had almost given up hope, when the nuns in their parish started a novena to Saint Philomena for them. At the same time one elderly nun starting making baby clothes because, according to her, “Saint Philomena never fails.” Nine months later Jane arrived. Her mother still has the baby clothes which were made for her by that sweet nun with the great faith in Saint Philomena. When Maria was pregnant with her seventh baby, she was diagnosed with cervical cancer. Maria consecrated the baby to Philomena and asked for her help. She used Saint Philomena Oil during her pregnancy. The doctor told Maria that it was important for the baby to have mature lungs and to gain lots of weight. The baby was delivered six weeks early; but he weighed a whopping 6 lb. 5 oz. - two and a half years later Maria was cancer free and her son is a healthy energetic boy. Saint Philomena is truly a powerful intercessor in heaven. Two ladies from Australia traveled back to their home country of Belgium for a short holiday. In their days growing up in Belgium they had always enjoyed going to the annual tridium (three days of prayer) and festivities in honour of Saint Rita. During the holiday they were standing on the balcony of their hotel room, when a leaflet floated down and landed in front of them. They picked it up and were delighted to see that it was the program for the tridium. It had not even crossed their minds that it would be on at this time of the year. Saint Rita made sure that they did not miss out on attending her festivities. The following story comes from a religious sister in Africa. My sister had to travel about 800 km from the capital city back to her home town, but she did not have money for the transport, which costs $150. Our other sister and brother did not want to help her. I had no means of helping her to go back home, but something happened for her through the intercession of the Holy Souls in Purgatory. On the second day of my prayers for them, I heard that some of our sisters were coming to the capital city for a superiors’ meeting, so I called one of the superiors who came from my sister’s town, at first she told me that they were coming to the city by public transport, but later on she changed her mind and came by car, therefore my sister had a free lift back home. I thank the Lord for his wonders and love through the intercession of the Holy Souls in Purgatory. The following event took place in Ireland over seventy years ago. A lady was seriously ill and needed urgent medical attention, however the family did not send for a doctor, because they could not afford the necessary fee. They knew that the doctor would not come to the house unless they could pay the fee. Later in the day the doctor arrived (unexpectedly) at the house. He said that a tall girl with long hair had come into his office that day and had paid the fee on their behalf. The family had not mentioned the matter to anyone except to Saint Philomena in prayer. The following story comes from Australia. It is told here in the words of Filomena’s mother Elizabeth. Having been married on the feast of Mary the Mother of God on the 1st of January, 2000, Francis and I were trusting that God might bless us with a baby at some stage. This was going to be a big challenge for me, as I had never considered myself to be very maternal because my reproductive cycle was always extremely “light on” or in other words “spaced out.” Nevertheless my husband was always trusting in God’s providence and he never doubted that one day we would have a baby. I think that I “flunked” the Billings Ovulation method because in the end, our Billings practitioner was not convinced that I had been fertile during any of the months that we had consulted her, so Francis and I stopped the analysis and started praying. Instead of consulting the medical fraternity we consulted Jesus in the tabernacle and prayed many Saint Philomena Chaplets before a statue of Saint Philomena at Saint Patrick’s in the city. In April 2001 I discovered that I was pregnant.The great miracle had happened. Saint Philomena made her presence felt very strongly during the labour and we subsequently named our gorgeous daughter Filomena. There were some special pointers that Saint Philomena had indeed interceded for us in bringing about this great favour. One of these indicators was a small incident with an Italian friend of ours. She came and visited our baby daughter when she had just been born. She then put a question to her father when she got back home asking him to guess what we had named our daughter. He paused for a couple of seconds and then said “Filomena.” Our friend could not believe it! Incredible, how did he guess it? Our friend said that the name Philomena is an extremely old fashioned name in Italy and a name that probably only one’s grandmother or great grandmother might have. We thank Saint Philomena for her intercession and pray that we will able to have a brother or sister for our little Filomena. This story comes from Sydney, Australia. It is related by the mother of the boy, who is the recipient of the favour. When one of our teenage sons began drinking heavily, smoking pot and being involved with a heavy metal rock band, my husband and I decided to give him over to the care of Saint Philomena, who we had heard was a patron saint of youth and a wonder worker. We had heard her story and had been impressed by the many miracles which had been attributed to her intercession. We prayed a novena and went to our first Mass in her honour. As the Saturday night binges progressed to the whole weekend and then to week nights we decided to pray the novena continuously, imploring Saint Philomena desperately as our son’s condition continued to worsen. By this stage he would come home from work and prowl around restlessly until the phone rang and then he was out again. His pores oozed the sweet/stale smell of beer continuously. Usually he was very gentle – even when he was drunk, but he became more agitated, blaming us for filling him with all the “God stuff” as he was growing up. This occurred on the Saturday night of the August Mass in honour of Saint Philomena. The week that followed was very distressing. He went off to work on the Friday at 5am as usual and I was surprised when he came home at 1.15 p.m. – his usual home time on Fridays, but lately he had gone straight to the pub and we were lucky to see him all weekend. My son came out of his room and put a broken CD into the bin. I was again surprised and so had a look at the title of the CD. He had dozens of heavy metal CDs. It was named “Diabolos Music.” I said, as I had often said, that means Devil’s music and that it was dangerous. Usually he would laugh it off, but this time he said “I know mum.” He brought out the printed lyrics of the song and said that the words to this song kept going through his mind and that he felt that he was going mad, but that he was at peace now. I was almost too scared to ask him why? how? when? I just asked if he had called on God and he said “Yes.” At work that morning he had experienced an overwhelming sense of peace and love. A feeling of great burden had lifted off him. He felt the presence of a woman. He looked around but there was no one there. My son still had the music filling his head – so I gave him a much better tape to listen to. When his mate rang that night, before he left, he asked us to pray for him and said that he would not be late. After a couple of Rosaries and Divine Mercy Chaplets, we were disappointed as the night wore on, because our son did not turn up. Finally around 2 to 3am he came in. My husband hurried out and I started another Rosary – hoping that my husband wouldn’t ruin the obvious start that my son had made. When my husband finally came back to bed a few hours later, he said that they had been talking and praying the Rosary together. My son had waited back to make sure that his friends got home safely. He wanted to go and tell them about his experience. They were not interested and as he listened to them, all he would hear was “hate” in their talk. That morning August the 15th was the feast of the Assumption. He went to the Sacrament of Confession and afterwards he shed many tears. Our eyes were also filled with tears of joy. He went to three of the four Masses that weekend and did so for many months after. He has never drunk alcohol, smoked pot, nor has he listened to heavy metal rock music since that time. He threw out all his CDs and heavy metal T-shirts. His conversion was sudden. We felt that it was miraculous. He now has a great love for Jesus and Mary, for Saint Philomena, the Pope and for the Catholic Church. Looking back now we can see the strong spiritual battle that was going on for him in those last few weeks. He even said a couple of times that he was tempted to go and kill someone. We continue to pray the novena to Saint Philomena for our son for his continuing conversion and thanksgiving and “with joy in our hearts, we will bless God who is admirable in His Saints.” Our son attended the World Youth Day in Rome. (M.W.) Editor’s note: This conversion took place in the late nineties and is still going strong today. This following story comes from Scotland. I was introduced to the devotion to Saint Philomena about 1985. The minute that I saw her picture I was drawn to her and longed to know more about her. From that moment my life changed for the better. At that time we had three children and my husband David and I worked for local government in jobs which we hated. What I always wanted to do, was to be a good mother and wife at home; however we had always over committed ourselves financially and I had to work while my mother looked after the children. This was unfair to her. In the job that I had, I have worked in both full and in part time positions. I was working part-time when redundancies were introduced. I prayed to our saint that I would get my redundancy, since I was desperate to leave, however because I was working only part-time, I would not be getting my full redundancy money. The payment would enable us to pay off some of our debts. I prayed very hard to Saint Philomena, but I did not receive the desired result. I felt so disappointed and continued praying to her that I would get it somehow. Seven months later I reached the point, where I accepted that this was probably not God’s will. To make matters even worse, the person who shared my job left. I then had to work full time. To my surprise a short time later, I was offered my redundancy package based on a full time job! We would not have a great deal of money to get by on, but we would be able to manage.This was Saint Philomena at her best giving me a chance to do a proper job of raising my children. This was just the beginning of Saint Philomena’s intercession for our family. My husband was still in a job which he hated. I thought that I could make things better, if I was at home and made things good for him when he came home from work; however he was miserable in his job. He then thought about starting up his own business in computer support. He then applied for his redundancy and was one of the very few employees who received it. We paid off some more of our debts and purchased some badly needed wardrobes for the bedrooms. These were a necessity, not a luxury. We had a small amount of money left over. Two weeks after my husband accepted his redundancy, I discovered that I was pregnant. This following story comes from the USA. The priest mentioned in this story was born in Australia and grew up there. He was educated at a school run by the Sisters of Saint Joseph of the Sacred Heart (the order founded by Blessed Mary MacKillop) in Adelaide, South Australia. Here is Father’s story. On Saturday the January 29th, 2005 I woke up feeling really out of sorts. I confess that I hadn't felt this bad since the morning after my 21st birthday party in 1965! Puzzled, I showered, and then noticed that both shoulders were aching badly; I had been treated a few years earlier for Bursitis in one shoulder, but this was like a double dose! I fed my dogs and then made a cup of tea. (Things are always better after a cuppa!) and sat on the sofa, looking out the front door, but the aching got worse, and it became hard to breathe. For the life of me, I couldn't think what was wrong. (At that time my only knowledge of coronary symptoms was numbness in the left arm and jaw.) I was wondering what to do, and what on earth was wrong. I suddenly saw a movement out the corner of my eye, in the small hallway to my right. I automatically turned to see what it was. In the hallway were standing Father David my assistant, and a Josephite nun, being an old Saint Joseph's Russell Street boy, I immediately recognised "Mother Mary of the Cross" as we called her, the foundress of the Sisters of Saint Joseph of the Sacred Heart, in Adelaide in 1866. Father David, had died of Pancreatic Cancer in 2002! Yet, there they both stood; quite real, no lights, clouds, or music. And oddly, I felt too ill to be impressed or surprised at the time! I blurted out to Father David (who was 64 at the time of death, but who now looked late twenties in cassock and surplice, but easily recognisable); "is this the big one?” - a private joke of ours from the TV show "Sanford & Son". He just smiled and shook his head - he never actually spoke. I got the impression that he had somehow wrangled a "ride" on this expedition, and Blessed Mary had agreed, as I'd pay more attention if he was seen(?). Mary, however, spoke; she was dressed in her usual habit; plus traveling mantle; (I still find Religious, disguised in lay clothes these days to be somehow dishonest, as if they're ashamed to be identified.) She seemed also to be in her late twenties, quite alive, and solid, like Father David. During the Angioplasty, Blessed Mary Mackillop and Father David appeared again, and helped me when a problem developed. The Cardiologist later informed me that the coughing most likely saved my life, as they were experimenting, and it appeared coughing kept the heart and lungs steady. Sure enough, ten months later, the AMA publicly announced on TV that aspirin combined with coughing was the way to go-until medical help arrived, yet, Blessed Mary of the Cross, came from heaven and gave me that information ten months earlier! So to (soon to be) Saint Mary of the Cross I owe my life! As soon as I recovered I erected a shrine to her in our Chapel, and we celebrate her feast each year on the first Sunday in August. *Blessed Mary MacKillop was born in Australia to Scottish parents. Many years ago an eight year old girl in Ireland, found a brand new Saint Philomena medal on her bed. She asked all the members of her family if they put it there. All of them told her that they had not. She recognized the event as something special and because of the find; she developed a life-long devotion to Saint Philomena. She later went to Australia and became a nun in a religious order there. Joanna’s younger brother and sister both had the bad habit of putting their wet hands on the electric light switches. One night Joanna’s mother received a striking sign from Saint Philomena and straight after that, she heard Joanna scream. When Joanna turned on the light she got electrocuted. Joanna felt the 240 Volts travel right down her arm, despite this she was alright and no real harm was done. Joanna’s mother attributes this protection to Saint Philomena. A priest who heard about this incident quipped that “You could say that she is a girl with good connections!” Joanna’s family has a strong devotion to Saint Philomena. On one occasion when Joanna was traveling on the train to work, she looked at the train window and was startled to see a coloured image of Saint Philomena on it. Joanna looked around and then noticed that a passenger in a nearby seat had a prayer book with a picture of Saint Philomena in it. This picture had reflected onto the train window. Although this is a natural event, Saint Philomena uses many kinds of events (both natural and supernatural) to give signs to her devotees. This story comes from Australia. During the season of Lent, Elizabeth attended a weekday Mass one morning. Every statue in the church was completely covered with purple cloth, as is the custom at that time of year in the Church’s Liturgical Calendar. As Elizabeth was returning from Holy Communion, she was startled to see the statue of Saint Anthony, which she knew had been covered only a couple of minutes ago. When she checked a short while later, it was covered; just as it had been earlier. She knew that this was something out of the ordinary. Elizabeth told her husband about this strange event. She wondered what it meant. Later in the day she and her husband went for a drive to the next suburb. Elizabeth had lived nearby for many years and knew that there were two Catholic Churches in this area (the parish church and a church where the Polish community had Mass celebrated in their own language.) As far as she knew there were no other Catholic Churches or chapels in that suburb. As they continued to drive she was stunned to see a Catholic Chapel which was named Saint Anthony of Padua. It looked as though it had been there for many years, however Elizabeth never knew of its existence. She has since learnt that Mass in said there in Italian for the Italian Community. A teenage girl was very determined to go to an objectionable rock concert with her friends. The girl’s mother in her distress prayed to Saint Philomena for a way to stop her daughter from attending. The girl came down with all the symptoms of Glandular Fever and was prevented from going; however the doctor told her mother that although the symptoms of the disease were present there was absolutely no problem with her daughter’s blood cells. The following story comes from the USA. A lady I know ruptured her colon in a car crash. For several days in a row after the accident, she kept coming back to the emergency room visibly worse each time, but the doctors kept sending her back home with palliatives, a condescending smile and a tap on the shoulder. When her symptoms got so awful that they could no longer ignore them, they finally ran the tests that they should have run at the first sign of trouble and rushed to remove her colon, but unfortunately it was too late: she had already developed a life-threatening full-body infection. After surgery she ended up in the intensive care ward with IV antibiotics that are so powerful that they caused seizures as side effects. She was in and out of ventilators, and was unable to eat by herself. (She had feeding tubes going down her nose, poor thing!). She had been in this awful condition for over a month when I heard about it and started a novena for Blessed Teresa's intercession. On the seventh day of the novena: she was discharged from the hospital and was clear of all infection. She felt so good that she considered going to a movie on the same day that she was discharged! Of course she stayed in bed, but the very fact that she had the energy to even consider going anywhere is a miracle. I contacted Blessed Teresa’s cause for canonization to see if I could report this as her second miracle, but I was unsuccessful for two reasons. Firstly, the antibiotics could theoretically have worked without prayers; however they only started working after prayers! It is also unlikely that the doctors involved, would have been comfortable answering questions regarding this case for the canonization investigation, since the lady’s medical condition was handled poorly and her family was far from happy with how the medical fraternity had treated her. Kirra spent two years praying for a special favour. Finally in desperation she decided to make a 54 day Rosary Novena for the intention. Three days before its conclusion, a dramatic and thoroughly unexpected event took place. Kirra knew from this that her prayer had been granted. It was granted in a far bigger way than she had asked for. Kirra’s daughter also on two different occasions made 54 Day Rosary Novenas for very difficult problems. The favours petitioned for in these novenas were also speedily granted. Jill went unconscious, when she was in the bathtub and hit her head very hard against the tap. The doctor said that she could have died, judging from the position of the blow to the head, but she survived and is well and did not suffer any ill effort. Jill was wearing a blessed Saint Philomena Cord at the time. Saint Philomena protects those who wear her blessed cord. Editor’s note: A tap is called a faucet in US English. A blessed Saint Philomena Cord was given to a lady who was suffering from ovarian cancer. As soon as she put the cord on, all the pain left her. She then received about three doses of chemotherapy, instead of the usual thirty doses. During the surgery it was found that all the cancer was gone.The surgeon called it a miracle. A lady who was distressed, because she had failed to become pregnant over a period of five years was given a book on Saint Philomena and a blessed Saint Philomena Cord. She conceived a child three months later. The child is now eight years of age. The sacraments bring us grace, but they can also bring about physical healing as well. In one case a priest administered the Sacrament of the Sick to a dying woman and she was restored to good health immediately and in another case a priest blessed a very sick person in a hospital and that person was also restored to good health. Pam visited her friend. When she arrived she found her friend was very sick with diabetes, so Pam went back to her car and got a bottle of Saint Philomena Oil. It was applied to her friend’s forehead and Pam said a prayer for her. After that the friend said that she was felling well. A lady who was being verbally abused silently prayed to Mary, with the following prayer: “Mary Help of Christians, pray for us. Mary please get someone to telephone me, so that I have a way to get out of this situation.” Shortly after the prayer, the phone rang and she went to answer it. It was a relative who told her that; she was going to ring much later in the day, but something told her to ring immediately. Call on Mary in all your difficulties with the little prayer, "Mary Help of Christians, Pray for us" and you will never call in vain. "Spread devotion to Mary, Help of Christians, and you will see what miracles are." Saint Anthony did get the mail through! Louise posted a number of letters. On each of them she put in small print: S.A.G. which stands for Saint Anthony Guide. Writing S.A.G. on envelopes is a custom which developed centuries ago, because of some astounding miracles which were wrought through the intercession of Saint Anthony, in getting mail from Europe to the New World in record time. (In one case, it only took one day.) This was during the period when ships took many months to travel the distance and bring the mail. One of the people who Louise posted a letter to (who lived in the same city) rang up a few months later and said that she had not received a letter. (She had been expecting the letter to arrive.) Louise was baffled by this, because she knew that she had entrusted the mail to Saint Anthony’s protection and she believed that he would not fail her. The lady later found the letter under some other mail, which she had put aside to read later. Saint Anthony had done his bit! One morning as I approached the priest to receive Holy Communion, I felt very ill as though I was about to pass out. I managed to cope and receive Holy Communion but I was very shaken by the event. On the following Sunday as I approached the acolyte to receive Holy Communion, I felt unwell again and suffered a panic attack. It was so bad that I left the queue and returned to my seat. The attack was so strong that I felt pain in my chest. Naturally I felt greatly distressed by this disturbing occurrence. My husband and I walked home quickly straight after the Mass. On the way home one of the acolytes saw us and asked if we would like to come inside and visit his wife. (His wife is an older lady and she was unable to attend Mass at that time due to her medical problems.) My husband explained that I was feeling ill and because of that I had been unable to receive Holy Communion. The acolyte then told me that he was about to give Holy Communion to his wife. He then also gave me Holy Communion as well. Jesus consoled me on this very difficult occasion. He did not abandon me. This favour story was received on email: My cat has been having a problem with her teeth. She hasn't wanted to eat her dry food. My family doesn't really have money for a large veterinary bill right now, so I turned to the Holy Infant of Prague for help. I prayed the Chaplet of the Holy Infant Jesus and asked Him to heal my cat's teeth. Today, she is eating her food normally and doesn't seem to have any pain. Thank You, Holy Infant of Prague. The following story suggests a bit of help from above. Melanie phoned a library which had Catholic books, and enquired about a particular book regarding Saint Philomena. The man who took the call went ballistic and gave her a dressing down. He clearly did not care for Saint Philomena. After this unpleasant incident, it took a whole year for Melanie to make another attempt. She phoned the library. The lady who took her call said, “I don’t think that we have that book, but I will get the librarian to ring you when she gets back from lunch.” The librarian returned the call. She expressed surprise that Melanie had requested that particular kind of book. Why don’t you ring (and here she mentioned a particular library.) Melanie informed her that was the library that she thought that she had phoned, so the librarian told her, “We are a private academy library for cadets, and we aren’t even listed in the phone book” then the librarian said, “I know the librarian at the other library. He is a good friend of mine. His name is ….” (here she gave his name.) Melanie armed with this useful piece of information phoned the other library and confidently asked for the librarian by name. The librarian was only too pleased to help her. You guessed it; she got to borrow the book on Saint Philomena! When Kate was six months pregnant she suffered a severe heart attack, which resulted in high blood pressure. Kate was in danger of dying. Her husband’s sister gave him a Saint Philomena novena prayer book. Kate and her husband made the novena and she delivered her child without any pain at all. The parents named their child after the wonder worker Saint Philomena. Our Heavenly Father knows our needs and sometimes provides them, even when no prayer has been sent up. I had a treasured instruction manual on typing, that I had used in my secretarial course. It was a large manual with many examples, layouts and techniques used by typists in various kinds of businesses: legal, commercial, medical, etc. Unfortunately it was a bit worn and the protective cover was missing. I wished that I had a better copy of the book. The night before the parish fete, I had a dream and in the dream I saw a copy of this book on the used book stall at the parish fete.The next morning I went to the fete and headed straight to the book stall. I searched through the many books there and eventually found the typists’ instruction manual. It was in excellent condition. It was an updated copy which now included new sections on word processing, which was just starting to come into vogue. I handed it the lady who was running the stall with my payment. She was astounded to see it, because she had also wanted a copy of this book and had not noticed it when she was setting up the stall. She no longer had a copy of the book, which she had used at Technical College, so I gave her my other copy. Divine providence provided in this case for two people. A comment on this story: most of our dreams have no special meaning. Debra was engaged to be married, so she went to the local library and borrowed a book on how to cook. After a few weeks the book went missing from her bedroom, so she searched everywhere for it. Finally she gave up and went to the library and told the librarian that the book was missing and offered to pay for a replacement copy.To any reasonable librarian this would have been okay, but not to this particular librarian. She demanded that the book be returned. Debra went back home and searched again, but to no avail. She returned to the library and again offered to pay the replacement cost of the book. Debra told the librarian that she was soon going to married and would be moving out of her parents’ home. To the librarian this made absolutely no difference at all. She demanded that the book be returned, even though it was nowhere to be found! The librarian was the perfect bureaucrat. Debra was intimidated by the librarian. (Today if she were to be treated in the same manner, she would ask to see someone with more authority than the librarian.) The situation dragged on. The night before her wedding Debra still had the lost library book weighing heavily on her mind. She begged Saint Anthony to help her to find it, so that she could enjoy her wedding in peace. She had one more desperate search and found it under her brother’s bed covered in dust. My son John suffers from severe autism. Some of my other children are also on the autism spectrum. John is a tall boy and he lost a lot of weight and as a consequence he became alarming thin. We did not know what was causing this problem. Our family and the carers in his group home feared that if the situation did not improve, that he might not survive. Doctors could not find the cause. The situation continued to go downhill and John lost even more weight, even though he was eating large amounts of food. One of my daughters and I visited the tomb of Blessed Mary MacKillop at North Sydney to pray for a healing for John. I organized with a Sister of Saint Joseph at the shrine, for an official novena to be made for John. I asked for it to begin as soon as possible. The sister said that it had to be delayed for a few days, and she suggested a day to start the novena, without knowing it, she chose John’s birthday, August 4, the feast of St John Vianney, the saint who John is named after, and who is also the patron saint of our parish here in Doonside. After our visit to the shrine, we walked down to Circular Quay. There at the Quay was a ferry named: Mary MacKillop. I had heard of it through radio and television, but had never seen it before. We then traveled to Saint Patrick’s, Church Hill in the city. There were Catholic Weeklys for sale and there was a picture of Blessed Mary MacKillop and an article about her on the cover page. When I arrived home I logged onto the internet and went to a big American website that I visit often. There was a link there, telling everyone about the planned Mary MacKillop feast day celebrations at North Sydney. I was very worried about John, and I took hope in these signs and continued to pray and I also asked others to pray for John. The cause of John’s weight loss was found and remedies were put into place to stop him from losing even more weight and to help him to gain weight. In time things went back to normal and John’s weight was okay again. We also prayed for and to the Holy Souls in Purgatory seeking their intercession for a healing for John. An artist friend of my sister and I told us last winter that he had been commissioned to paint a picture of Saint Philomena. The artist is not a Catholic but after visiting Assisi, he developed a deep devotion to Saint Francis and made several paintings of him, as well as a collection of bronze statues. He even had the honour of presenting one of his bronze statues of Saint Francis to Pope Benedict. When I found out that he had been commissioned to paint a picture of Saint Philomena, I was very excited since I have a deep devotion to her. (Saint Philomena has been an amazing advocate in my life.) I quickly shared material about her with him and invited him to a play about Saint John Vianney, because Saint Philomena was so much a part of Saint John Vianney’s life. My friend attended the play with his wife and they both really enjoyed it. (My sister and I are praying to Saint John Vianney and to Saint Philomena for their conversion to the Catholic Church.) I gave him a relic of Saint Philomena as well as some blessed oil from her Sanctuary in Mugnano del Cardinale, Italy. He asked my sister if he could open the oil and she said of course, and she taught him how to bless himself with it, which he did everyday while painting the picture of Saint Philomena. He then mixed some of the blessed oil with the oil paints that he was using to paint the picture with. The wife of the man who commissioned my friend to paint a picture of Saint Philomena has been diagnosed with an incurable melanoma cancer on the inside of her body. After talking to his parish priest Father Mike of Saint John Vianney's Church, the man decided to dedicate a painting to Saint Philomena, who has been known to obtain healings in very difficult cases. Since that day, his wife has amazingly been in remission, something that has not happened since she was diagnosed. There was a private unveiling last Wednesday, August 4, for the family that commissioned the painting. It was followed by a Mass and an unveiling of the painting for the parish. Father Mike cried as he unveiled the painting of Saint Philomena. It was so touching. I too cried as I saw her for the first time. She’s absolutely GORGEOUS!!!! Seriously stunning! It is truly her. The artist did an incredible job! Saint John Vianney's Church in Grand Rapids, MI is the permanent home for the painting. After the Mass, Father Mike asked me to share my testimony of Saint Philomena and how she’s been by my side through my journey of recovery. I first learned about Saint Philomena in high school fifteen years ago. Her story touched me, and I would ask for her intercession from time to time over the years, but my devotion to Saint Philomena has become more passionate since I was reacquainted with her last year. On June 29th, 2009, I was a victim of a random robbery and was shot in the chest. The doctors are calling me a miracle, because the bullet missed my heart by 1 cm. My esophageus was hit by the bullet and was severely damaged, while fragments of the bullet hit both of my lungs. It took eight hours of intense surgery to repair my esophageus. The doctors placed two tubes into my right lung and one into my left to drain them after they collapsed. Several friends came to the hospital and prayed for me while I was in surgery. Later they came two by two to stay and visit with me. They all brought different sacramentals to my hospital room, crucifixes, pictures of Our Lady of Guadalupe, prayer cards, Holy Water, etc. When my family arrived three days later, (they had to travel across the country from Michigan to California) my dad saw that someone had brought a pamphlet about Saint Philomena containing a litany, a novena and several prayers to Saint Philomena, he exclaimed that he knew that I had a devotion to her and from then on he prayed the entire contents of the pamphlet every day while kneeling at my hospital bed. My doctors and surgeons said that I would spend at least two months in the hospital, but thanks to the prayers of many people from around the world, the intercession of Our Lady of Guadalupe, the intercession of Saint Philomena and by the Grace of God, I was released only ten days after the incident. The print editions of the book contains two extra stories. Both of these stories attest to the power of the devotion to the Divine Mercy. The on-line version of the book was last updated on August 11, 2014. Please check back from time to time, because I often add new stories and information to the book. They will be added to Part 2 and part 3 of the Book. If you have a testimony about an answer to prayer, that you think might be suitable for this project, please let me know. Part 3 of the book has more stories of answers to prayer, articles, prayers and poems. Please let your family and friends know about this online book and where to find it.